One night out from Havana. Aboard the Morro Castle, passengers gather in the Deck Ballroom for a costume party. In less than four days time, the liner will be destroyed and 128 will be dead. In four hours it would all be over. The Morro Castle, flagship of the Ward Line, would be approaching Manhattan and her pier at the foot of Wall Street. Her passengers would be returning to the world of every day concerns, carrying with them mostly pleasant memories of seven days spent aboard America’s favorite cruise liner. Outside, the rain that had begun falling early in the evening was beating down, the lights of the New Jersey shore were occasionally visible to port through the storm wrack, and the seas were running high in the face of mounting winds. Inside, most of the passengers had retired for the night in preparation for the controlled chaos of disembarking the following morning, but perhaps two dozen of the more energetic remained awake in cabins widely scattered around the ship, and in the public rooms on B Deck as the clock approached 3 a.m. on September 8, 1934. Max Berliner, a genial tobacco merchant from Queens, New York bade farewell to the last of the guests who attended his stateroom party. 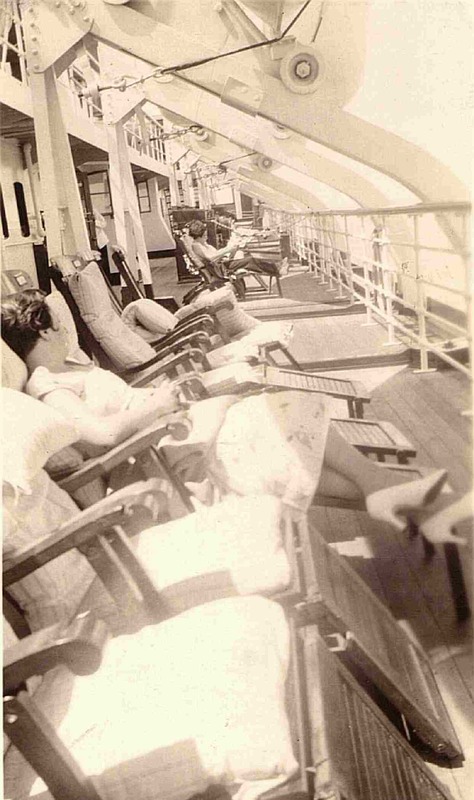 Mr. Berliner was traveling in Deluxe Cabin 10 on A Deck, located directly above the liner’s writing room. His party had been well attended, with many passengers dropping in over the course of the evening, but now with disembarkation only a few hours off, his final guests, Mr. Israel Rudberg, Mr. Milton Klein, Miss Adele Wallace, Miss Sydney Falkmann and Miss Elmira Thompson took their leave. Mr. Berliner would be returning to his wife and three children in just a few hours and it is likely that the 41 year old man soon went to bed to rest up a little for what would surely be a busy day. Miss Eleanor Brennan, head buyer for the Curtains and Draperies Department of Macy’s Herald Square store, also hosted a stateroom party that evening. Eleanor had come far on her own. Born in a rural community, she had been compelled to drop out of school to raise her younger siblings upon the death of her mother. When the children were old enough to be self sufficient, she began commuting to New York City, took a job at Macy’s and worked her way up through the ranks. She was unmarried at 38 but, by all accounts, was not suffering for it. She traveled in one room of the ship’s finest two room suite, C-235/37, and was taking her second Morro Castle cruise of 1934. She and her friends, among them cousins Helen Brodie and Agnes Berry, Father Raymond Egan and his cabin mate 16 year old Louis Perrine, and Mary Robinson and her teenaged daughter, Lucille, decided not to go to bed at all, and a little before 3 a.m. put in a call to room service for sandwiches and Highballs to be sent up to C-237. So, when a knock came at the cabin door around 3:30, there was no reason for the guests to suspect that anything was amiss. German Vice-Consul to Cuba, at Matanzas, Clemens Landmann and his wife and daughter occupied the next cabin aft of Eleanor Brennan‘s. Mr. Landmann had served as a diplomat in Cuba since 1912. His daughter Marta, born in 1922, spoke only Spanish and Mrs. Landmann, shown as “Jose” on their FBI statement, was apparently a Cuban. The Landmanns retired early, but the noise carrying over from Eleanor Brennan’s cabin kept the Vice-Consul awake and some time after midnight he took a sleeping pill. Miss Marjorie Budlong, of Hillside, New Jersey, an 18 year old student at Greenbriar Junior College, sat in cabin A-17 with her friends, Rosario Camacho and Doris Wacker. Marjorie was traveling as the guest of the Wacker family, and she and Doris had become acquainted with Miss Camacho, an 18 year old Cuban who was en route to her apartment near Columbia University in New York City. The three decided to stay up and see in the dawn as the ship entered New York Harbor, and had passed the evening having the aimless sort of fun one has on the last night at sea. They visited with friends in the lounge, passed time in Miss Camacho’s cabin admiring her expensive wardrobe, and as the public rooms were beginning to empty out, went for a time to Miss Budlong and Miss Wacker’s stateroom C- 214 so that they could finish packing and Doris could change from her formalwear to street clothing. When they returned to Rosario’s cabin, it was a little after 2 a.m. and they saw nothing amiss in the empty writing room and nearly empty lounge through which they passed. The girls talked for nearly an hour, and at some point set their watches ahead to Daylight Savings Time. Doris Wacker grew tired and decided to return to her room. Miss Camacho rose to open the cabin door to see Doris out, coincidentally noting by her watch that it was 3:10 a.m.. From where she sat in the cabin, Miss Budlong thought that she heard Doris scream ‘fire!’ as she stepped in to the hallway, but from where Miss Camacho stood at the open door it was apparent that the scream had come from one deck below, in the lounge. 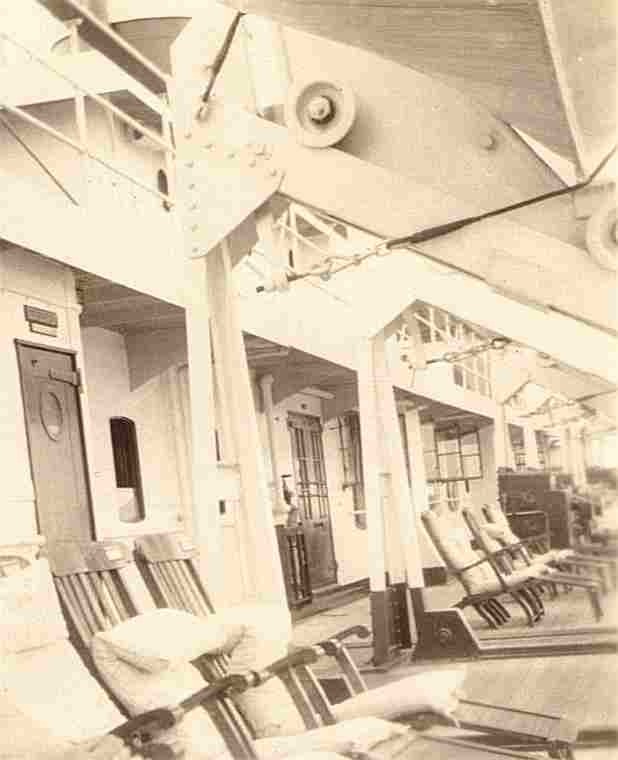 Miss Camacho‘s stateroom was one of the deluxe cabins that lined A Deck, also known as the Boat Deck. 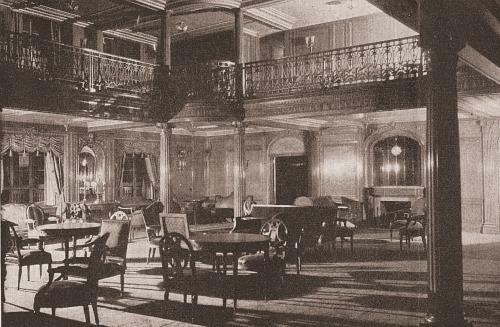 It was located just aft of the balcony surrounding the well on the upper level of the ship’s lounge, and taking a few steps forward from her door would give a person an unobstructed view of the grand, wood paneled, room below. The three friends rushed to the rear starboard corner of the lounge well. From where they stood, they could look diagonally, downward, into the writing room through the open doors on the forward port corner of the B Deck lounge. The carpet in the writing room was in flames, which covered the floor and rose perhaps two feet high. A man and a woman stood by the door of the room and from where the girls stood it looked as if the man wanted to attempt to fight the fire and was being restrained by the woman. A steward was calling to someone to hurry, but the girls could not see at whom the order was directed. Marjorie Budlong saw two men throwing something from buckets on to the flames, and a crew member called up to her that the fire was under control and not to worry. All three girls noted that no smoke was entering the lounge. They went back to cabin A-17, where Miss Camacho locked her window, closed and locked her trunk, and grabbed her handbag into which she had placed several thousand dollars worth of jewelry. When they returned to the lounge well railing, they were surprised at how quickly the fire had spread in the short time they were away. Flames were roaring aft, consuming the lounge carpet, and spreading across the room towards its port and starboard walls. The three turned and retreated from the inferno moving towards them. 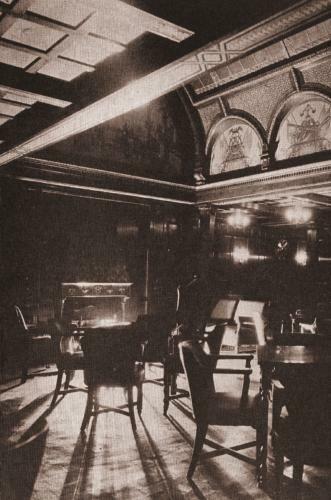 The Morro Castle’s B Deck public rooms were elaborate, wood paneled spaces, with a decidedly pre-World War One atmosphere. The focal point of the suite was the lounge, which rose through two decks and filled the entire space between the ship’s two funnels. 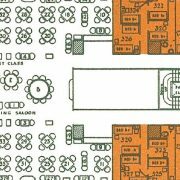 Because of the funnels, the lounge did not have a grand entrance- passengers going to and from the room had to pass through either the port side writing room or starboard side library to reach the Grand Lobby with its elevator and staircase. The equivalent spaces aft of the lounge were not occupied by rooms, but by hallways leading to the smoking room. The whole area was so well traveled, at all hours, that a fire could not possibly gain much headway without being discovered. James Flynn, of Philadelphia, stood in the B Deck lobby just forward of the writing room. 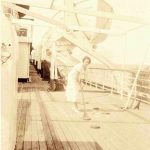 He had made the acquaintance of pretty Ann Conroy, also of Philadelphia, and the two passed a quiet hour together walking the length of the enclosed promenade decks that flanked the public rooms and deluxe cabins of B Deck. There was a chill in the air, and Mr. Flynn had excused himself to return to the cabin he shared with Milton Klein (D-355) in order to get a pair of steamer blankets. Passing through the deserted writing room, he heard a strange crackling from behind the door of a locker in its rear port corner. He headed back into the lounge, where a steward stood talking with some passengers. He brought the steward into the writing room, and when the man opened the locker door flames leaped out into the room. The steward slammed the door shut, but it swung open again and the flames set the carpet on fire. The steward ran aft into the lounge and Flynn ran forward through the lobby and passenger corridor of B Deck looking for a fire extinguisher. He did not find one. When he returned to the lobby, a passenger was pulling the fire alarm, and no smoke or flames had entered the area forward of the writing room. Crew members, wearing rubber gear, entered from the port side with a hose, and Mr. Flynn exited through the door through which they had just run and returned, aft, to where Miss Conroy was waiting. In his cabin directly over the writing room, Max Berliner never stood a chance. Evidence indicates that he woke up at the last second. His remains; teeth, a few charred bones and a Masonic ring, were found in the middle of the floor of Deluxe Cabin A-10, and not mingled with the remains of his mattress. In a stupor from the intense heat and smoke, he may have tried to reach the door or window of his room before collapsing. Only 45 minutes before, more than a dozen people had been taking light refreshments in the first spot aboard the ship to become unsurvivable. Loretta Hassall, a 20 year old college student from Forest Hills, New York, had parted from her friends of the voyage, Henry Borman, Ann Litwak and Fannie Fryman moments before the writing room locker caught fire. The four had passed the evening conversing in the lounge, but at ten minutes of three they took the hint when a crew member began vacuuming the room around them and decided to retire for the night. Loretta noted that two women remained in the room, attempting to sleep on the sofas by the fireplace. 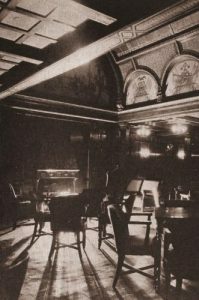 She briefly dropped in to the smoking room, where a few passengers remained awake, and then walked forward to the main lobby, passing through the empty library on the starboard side of B Deck. She noted no smoke or flames in the lounge, but when she stepped from the library into the lobby, she saw fire pouring out of the writing room door, towards the staircase. A man was pulling the fire alarm. She turned and ran back towards the smoking room, calling out “fire!” as she went. Loretta’s mother and father, Elsie and James Hassall were asleep two decks below the writing room, in D-304. 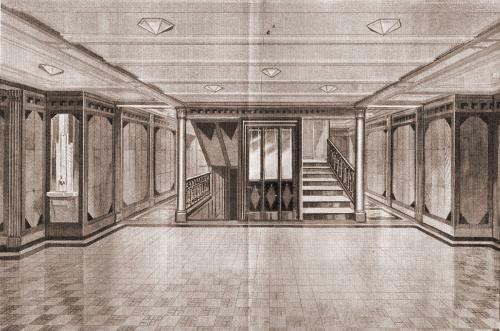 304 was an inside cabin, one of only a handful aboard the ship, and was located just forward of the grand staircase. Elsie was awakened by the smell of smoke entering through the ventilation system, and noted by her husband’s watch that it was 3:15 a.m. She opened the door to her cabin and saw nothing amiss. She must have walked a few steps back to the lobby, because she would tell the FBI that she went to where she could see a porthole through which the reflection of the fire on the ocean was visible. She ran back to her cabin and woke up Mr. Hassall. They put on their life preservers and then pounded on the door to D-310, in which their 16 year old daughter Ethel was asleep. Assistant cruise director Herman Cluthe came up and told them to be quiet, and that everything would be all right. 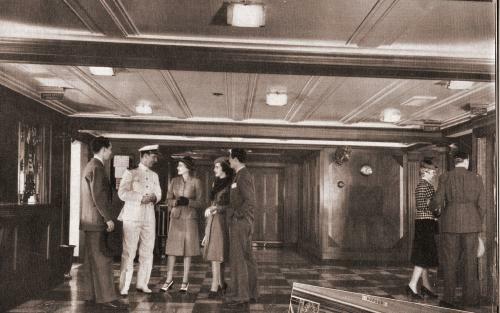 The C Deck lobby was empty, but when the Hassalls and a group of passengers walked up to B Deck they came across a scene of great confusion. People ran in all directions, and although they saw no flames, a great deal of smoke was pouring out of the writing room door and filling the port side of the room. The Hassalls exited through the starboard doors to the promenade deck and went astern, to the aft grand staircase. They wanted to go up to A Deck but were prevented from doing so by people coming down. The location of the fire, amidships on an upper deck, was singularly unfortunate. While the Morro Castle continued to sail northward, the flames were driven back through the lounge and smoking room, cutting off access to the boat deck by way of the aft grand staircase. 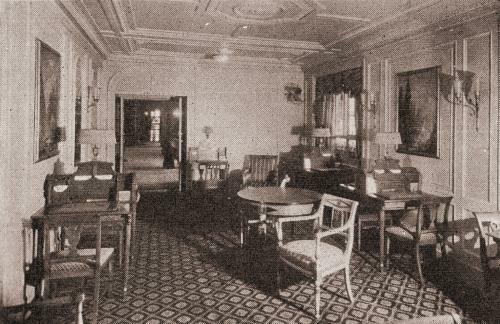 Just forward of the B Deck lobby was a series of eight luxury suites. These rooms were the only large block of cabins on ship to remain unoccupied. Perhaps twenty minutes into the fire a massive explosion, originating forward on B Deck, rocked the ship. It blew the flames into the forward staircase, cutting off upward escape for the occupants of cabins on C and D Decks. 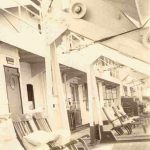 And no choice remained for most of the passengers except to head to the small, open, promenade decks that ringed the stern of the ship. Water, from outlets that had not been turned off when the crewmen and passengers manning hoses dropped them in the face of overwhelming defeat, sloshed on the floors. Thick, noxious smoke blew back overhead along the passages and, as it settled downward, it burned eyes and throats. Although the ship had an alarm system, and at least two passengers saw it being activated, the majority of those on board never heard it. Some were awakened by dutiful crew members. Others were roused by friends. Most, it seems, woke up reflexively when they smelled smoke, or were startled awake by the sound of running, and screams, in the hallways outside of their rooms. Many instinctively headed for the stairs, only to be driven away by the flames, and soon found themselves part of the same mob that had awakened them minutes before, heading for the stern. When the electric system burned though, perhaps a half hour into the disaster’s progress, people had only the reflected light of the fire to guide them along. Mr. and Mrs. Henry Jakoby, of Ridgewood Avenue, Brooklyn, and their 17 year old son, Henry Jr., were asleep in cabin D-361. The Jakobys were traveling with the Concordia Singing Society, of which they were not members, at the invitation of their friends Martin and Marie Renz, and Jacob and Minnie Likewise. Henry Jakoby was a brew master at Piels, while Mr. Likewise and Mr. Renz both worked in the painting trade. The Jakoby family had gone to bed at about 1 a.m. after packing their clothing and souvenirs. They were awakened by their friends pounding at the cabin door at a quarter to four. They only had time to partially dress, and put on their life preservers. Henry Jr. led them forward, but the way was impassable and to the group’s horror, the flames that were rolling down the staircase set his sleeve ablaze. They turned and fled aft. Miss Anne Behling awoke in cabin C-246, to the smell of smoke and the sight of fire reflecting off of the water outside of her cabin. Miss Behling was the private secretary to the Vice-President of the Atlantic Refining Company in Philadelphia, and her secure position afforded her the opportunity to travel frequently, by 1934 standards. She was a repeat voyager on the Morro Castle, and as such had been given a tour of the bridge by Captain Wilmott on the southbound leg of the cruise. He explained the workings of the ship in some detail, and told Anne of the fire prevention system, and of how the vessel could be divided into separate “containment” sections in case of the outbreak of fire. Miss Behling put on her coat and slippers and went out into the starboard corridor. She recalled, later, that there was much confusion. People did not know in which direction to head, and were asking one another, and crew members “What is happening?” Anne decided to walk forward to the grand staircase, but when she got to the dining room mezzanine she saw a wall of fire not more than ten feet ahead of her, blocking forward access along the port side. A man called to her “You can’t use this stairway- you’d better use the back.” She headed to the aft grand staircase and managed to climb it all the way to A deck. Ann Conway, of Prospect Place, Brooklyn, was startled by the sound of someone running in the corridor outside of cabin 230. She heard a child say “Mother, I haven’t got any life preserver.” Miss Conway was part of a group of congenial young people who socialized during the voyage, and had spent the final night aboard the ship dancing and playing cards with her friends Florence Roberts, Louise Taubert and Floride LaRoche, all of Rhode Island; Thomas Peirce, Morton Lyon, and J.M. Chalfonte, a trio of friends from Pennsylvania traveling together; Gouverneur Morris Phelps, Jr, of New York City, and Mr. Francis Stewart of Riverdale, New York. The party had broken up about an hour before Miss Conway’s sudden awakening. She ran across the ship and pounded at the door of cabin 219, where her three female pals were asleep, calling out to them that there was a fire. Mrs. Frieda McArthur awoke in cabin C-256, feeling indisposed. She rose to take some medicine and, as she returned to bed, heard the sound of running in the corridor outside of her room. She saw fire reflected on the water beyond her porthole, and saw showers of sparks falling past. Alexander and Frieda McArthur took yearly cruises with their friends Herman and Lillian Wacker, and were joined on their 1934 expedition by Steven and Wilhelmina Bodner, the Wacker’s daughter, Doris, and Doris’ friend Marjorie Budlong. As Alexander McArthur dressed, Frieda ran to awaken the Bodners, who were emerging from the door to cabin 242 wearing their life jackets as she arrived. She then ran back to join her husband. They grabbed their life jackets and went aft along C Deck. Charles and Selma Filtzer, of Kew Gardens, Queens, NY. were on their honeymoon. They retired to cabin D-318 at 12:00. Charles was the resident buyer for May & Co., on Broadway in New York City, and an avid sportsman. Selma was his first sweetheart, and they had been married only a week on September 8th. Mrs. Filtzer was shaken awake by her husband some time after 3 a.m. Their cabin was filled with smoke, which had presumably awakened Charles. The Filtzers did not hear any alarms, no one knocked at their door, and unlike many other passengers they were not startled awake by the sounds of panic in the corridor outside of their cabin. They put on coats and went to investigate. Selma noticed that water, from the abandoned hoses, was quite deep in the corridor outside of their stateroom. They returned to their cabin, got life preservers, and put them on. They made their way aft and upstairs to B Deck, and while they were climbing, the electricity failed. Abraham and Harriet Cohen, of cabin C- 215, were also honeymooning aboard the Morro Castle. 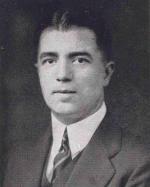 Abraham, a star high school athlete and Dartmouth graduate managed his family owned Grand Department Store in Hartford, Connecticut, while Harriet had attended Smith College, graduated from Simmons, and worked in the comptroller’s office at the G. Fox department store until her marriage. Earlier in the evening, the Cohens were among the guests at Max Berliner’s party. Harriet was startled awake by the sound of running and shouting in the hall outside of her cabin. Abraham remained asleep as she left the room and walked up the Grand Staircase, located steps from their door, to B Deck. There she saw the fire and mounting panic. Someone in the lobby gave her a child’s life preserver and helped her to put it on. She returned to her cabin and woke Abraham. He put his life preserver on. When the Cohens left the cabin, the fire had entered the staircase and was moving down towards the C Deck lobby. Abraham noticed passengers with a hose aiming water towards the ceiling. The Cohens walked aft to warn their shipboard friends, Mr. and Mrs. Samuel Vitale, and when they arrived at the Vitale’s cabin the couple was just emerging, in street clothes, and wearing their life jackets. All four went aft to the open promenade deck at the stern. Israel Rudberg, of Shenandoah, Pennsylvania, awoke to the sound of strange noises in the corridor outside of his cabin, C-274. He had left Max Berliner’s party with Milton Klein and Adele Wallace a little more than an hour before. When he opened his door he saw passengers with life jackets heading aft and smoke blowing back towards them. By his watch, it was about 3:10 a.m. He went aft, and up to A Deck while the stairs were still passable. He joined a crowd of passengers he estimated to number at least 40 who gathered at the rear of the liner’s boat deck. David Schneider, in cabin A-12, awoke to discover flames coming through the cracks under and around his door. Mr. Schneider had left Max Berliner’s party early, after spending time there with the Cohens and Miss Falkmann, and went to the nearly empty lounge to enjoy a cigar. He sat in a chair on the starboard side of the room, from which he could look into the library and across at the door to the writing room. When he left at 1:30, he noted that a boy in a dinner jacket and a girl in a white gown were still in the lounge. He was awakened by the smell of smoke around 3:10, began to drift off to sleep again, and was jolted fully awake as the fire entered his room under the door. He climbed out of his window on to the boat deck as the cabin burst in to flames. For Dr. S. Joseph Bregstein, the Morro Castle voyage had been a bittersweet occasion. His wife, Ethel, had died in January 1933, at the age of 29. He subsequently met, and fell in love with, Miss Muriel Rubine and by September 1934 was planning to marry her. 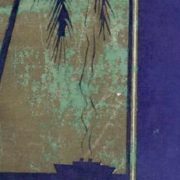 The cruise to Havana was meant to give the Doctor and his nine year old son, Mervyn, a chance to discuss his re-marriage, but the talk never took place and neither father nor son had particularly enjoyed the Morro Castle. They occupied Cabin D-301, a deluxe cabin at the furthest point forward on the starboard side of D Deck. Dr. Bregstein was a sociable man and made the acquaintance of many passengers. Some would later remember him playing popular music on the lounge piano. On the final night, he and Mervyn turned in at 9:30. His last act before retiring was to set his watch ahead one hour – he had read a notice about ship’s time and shore time earlier in the day, and remembered it as he prepared his son for bed. Mervyn had reddish hair and freckles, and was deeply tanned after spending the summer away at camp. He was to start the new school year on Monday morning. Jane Adams awoke the Bregsteins by pounding on their cabin door. She called to them that the ship was on fire. Joseph Bregstein and Mervyn dressed, with the Doctor buttoning a yellow rain slicker over Mervyn’s clothing before they stepped into the hall. They neither saw nor smelled smoke, but noticed water running over the floor in the hallway. Dr. Bregstein observed a flat hose on the floor and assumed that it was the source of the water. They walked back to the lobby, where people hurried about and water sloshed back and forth on the floor. Father and son climbed up one flight, to C Deck and went aft along the starboard corridor. While they were on the dining room mezzanine, the electricity failed. Dr. Emanuel Weinberger of Philadelphia, awoke in cabin 222, coughing from the smoke he had inhaled. He turned on the lights, and woke his wife. When they looked from their porthole, it seemed as if the entire front end of the ship was aflame. Dr. Weinberger went to make sure his friends, Mr. and Mrs Pannino, were awake. He noted, by the clock in the dining room, that it was 3:20 AM. The Weinbergers walked aft along the port side corridor, and climbed up to B Deck. From the sports deck, they could look forward, and up, to A Deck. The entire deck, including the gymnasium, was already on fire. Men on the port side of B Deck were aiming a hose up at the fire along A and the Weinbergers saw that the pressure was only fair. From the stern of B Deck Dr. Weinberger was able to look down at the water. He could tell by the wake and the suction that the ship was still moving, and was also turning. The Weinbergers saw one lifeboat in the water below them. It was moving away from the ship. George Whitlock, assistant Vice-president of the People’s Trust branch of National City Bank, was awakened in cabin C-265 by his wife Charlotte, who was concerned because she smelled smoke. 1934 accounts agree that Mrs. Whitlock was hampered by a “crippled” leg, but neither the newspapers nor her husband’s testimony offer a clue as to whether Mrs. Whitlock had been injured in an accident, or suffered from a degenerative condition. George left her in their cabin and walked forward. When he was still ten feet from the lobby, he saw that it was filled with thick, black, smoke. He returned to his room, and told Mrs. Whitlock that there was a small fire. They dressed and put on life preservers. As they were leaving their cabin, the lights went out. But before they went to the stern, and safety, they walked forward to the stateroom of their friends Edward and Adele Brady, to make sure that they were awake and preparing to escape. Adele and Edward Brady and their 18 year old daughter, Nancy Ann, were awakened in C-263 by the sound of running in the corridor. Edward Brady was in poor health, and the trip to Havana was to be a “restorative.” It is indicative of Mr. Brady’s state that 55 year old George Whitlock would later refer to the couple as “Mrs. Brady and old Mr. Brady.” Edward Brady, at 53, was younger than Mr. Whitlock. 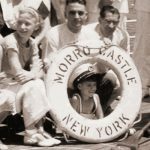 Nancy Ann Brady did not like the Morro Castle, and had begged her parents to return from Havana by plane, but they persuaded her to complete the voyage. And now the three found themselves trapped in a waking nightmare. Their friend, George Whitlock, appeared at the cabin to make sure that all three were awake and had lifebelts, before he returned to his wife. The Bradys rushed forward toward the stairs but were driven back by the flames that roared down them. They joined the crowd running towards the stern and found themselves hemmed in against the railing aft of the small lounge on C Deck. Smoke poured over them, choking them and burning their eyes. Edward Brady yelled to his family to jump, and the three of them went over the rail together, hitting the water with what Mrs. Brady described as a terrific impact. Husband and wife rose to the surface and clung to one another, and Mr. Brady repeatedly called for Nancy Ann, but she was gone. The current caught them and they soon drifted away into the darkness astern of the liner. 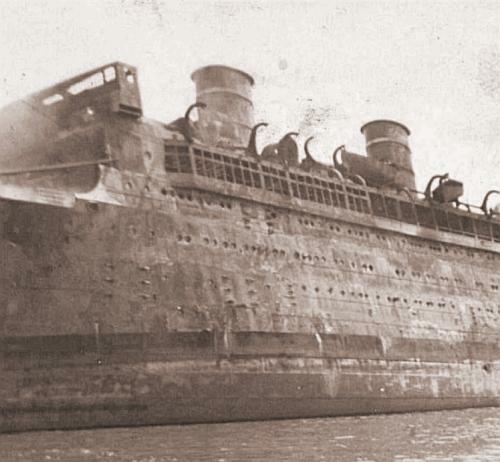 Nearly all of the Morro Castle passengers and crew were trapped at the rear of B, C and D decks within 45 minutes of the fire’s discovery. Just as the Bradys did, they found themselves confronted with the choice of jumping, burning or suffocating, with, seemingly, no other options. A strong authority figure might have prevented all-out disaster from unfolding, but the officers were isolated on the bow, almost 500 feet away. Left to their own devices, those on the stern remained calm and well behaved for a remarkably long time, given the circumstances. Passengers, such as the Cohens, Ann Conway, Jane Adams, George Whitlock and Frieda McArthur delayed their own escape in order to make sure that friends in other cabin were awake and on their way to safety before fleeing themselves. Steward Samuel Petty was last seen, alive, pounding on the doors of the cheapest cabins aboard the ship and rousing their occupants. Yet, despite many acts of heroism and few outright acts of cowardice, the scene on the stern eventually degenerated, as people began to suffocate and rooms not more than ten feet away from them began to burn. There was no organized escape plan, and no one to advise the trapped on how to safely evacuate a burning liner. Estelle Chesler had trouble falling asleep that night. She had been awake for several hours when she was startled by the sound of running in the corridor outside of the stateroom she shared with two of her friends from Brooklyn, Miss Bessie Weinrub and Mrs. Bessie Perlmann. Estelle opened her cabin door to investigate and upon stepping in to the hall saw a passenger fleeing aft. He called to her that the ship was on fire. She awoke her friends. All three immediately fled without grabbing their life preservers. They climbed up the enclosed, aft most, staircase to B Deck, where they saw crew members running forward. The women asked a crewman for life preservers, and received a shrug of the shoulders and a response of “I don’t understand English.” Finally, an English dining room steward gave the three women a small life ring, and they climbed from B Deck to A Deck. They joined a large crowd of passengers aft on the open sports area, by the gymnasium, on the port side. From where they stood they could see smoke, but no flames. They watched an unsuccessful attempt to prepare a lifeboat for lowering, forward of where they stood. Someone ordered the crowd below to B Deck, and the three women, still without life jackets, climbed down again. There they saw steward Pond and gym instructor Marco Apicella. Pond wore a life vest, and Apicella held one of the large Morro Castle life rings. The women asked him the best way to evacuate a ship with a life ring, and he replied that it was best to throw it over first, and then jump down to it. Miss Chesler, Miss Weinrub and Mrs. Perlmann asked if they could hold on to Apicella’s large life ring when they all went in to the water, and he reluctantly agreed that they could. All four watched the flames driven back towards them. The wooden deck began to burn, close to where they stood, and suddenly the gym instructor pulled away from them and went overboard. The three women forgot his instructions on how to use their life ring and jumped from the ship holding it. The impact knocked Bessie Perlmann out, or may possibly have killed her, and she lay face down across the life ring. A woman passenger in a life jacket swam up to them, and tried to raise Bessie’s head out of the water, but then a wave swept over them and Mrs. Perlmann was gone. Mrs. Ellen Kennedy, of Hamilton Beach, New York awoke to see the pink glow of flames on the ocean outside of her porthole. Earlier in the evening, she and her husband, James Kennedy, had socialized with shipboard friends Joseph and Claire Drummond. The Drummonds had married on the morning of September 1, 1934 in Philadelphia and after a wedding breakfast at the Hotel Normandy, boarded a train for New York City and went directly to the ship. They sent postcards home from Havana telling their families that the voyage had been “swell.” The Kennedys were married 14 years in September 1934, and had a four year old daughter, Ellen, known within the family as “Honey, who remained in New York with Mrs. Kennedy’s parents. Jim Kennedy, unfortunately, had a touch of indigestion and so retired early to bed. Ellen remained with the Drummonds until 12:40 and then went to her cabin and was soon asleep. After awakening and discovering that the ship was on fire, she roused Mr. Kennedy. They dressed, donned life preservers, and went out into the hallway. The Kennedys must have gotten a late start, because by the time they emerged and walked forward towards the stairs, the hall and purser’s lobby were deserted, save for a lone man playing a hose on the fire. The man would not allow them to walk any further forward, and the stairs upward were impassable, so they turned and went aft. En route to the stern they passed a steward carrying a hose. He seemed surprised to see them. Florence Sherman pounded on the door to cabin D-386 until her friends Francis Nass and Nathan Feinberg woke up. The three had attended Max Berliner’s party earlier in the evening, with Mr. Nass escorting Miss Sherman, and Mr. Feinberg bringing a girl named Margie Mayer. The men dressed and put on life preservers, and then walked to the stern of B Deck with Miss Sherman. From where they stood, it seemed that no boats were being lowered and no orders given. When the three asked for instructions, they were told by a crew member not to worry. 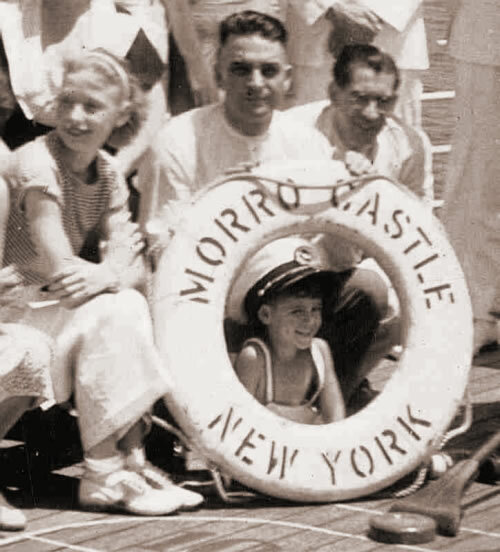 September 7, 1934, the Morro Castle’s final day, marked another milestone in what Doris Landes of Richmond Hill, New York, considered to be the most wonderful week of her life. She was aboard the ship with her friend and neighbor, Ann Stemmermann, 15, Ann’s mother, Christine, and another near neighbor, Mrs. Marie Byrne. Mrs. Byrne and the Stemmermanns shared cabin 503, while Doris roomed with Elsie and Ethel Suhr in 508. Ann Stemmermann had been a child advertising model, but retired by the mutual agreement of her parents and agent when she reached an age at which sexual harassment might have become an issue. Doris was a student at Richmond Hills High School, and carried a brand new “adult” wardrobe with her on the voyage. The four women had a wonderful time on the southbound leg of the journey; had taken the Ward Line-sanctioned tours in Havana (Shopping, a trip to the beach, more shopping, a car trip of Havana landmarks, more shopping, and an evening at a night club) and Doris sent a letter home to her mother, by airmail, in which she wrote glowingly of their adventures. 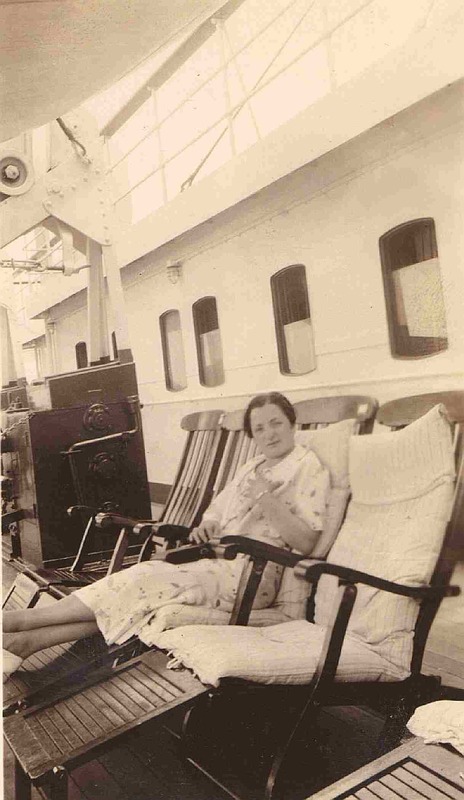 The final full day of the voyage was Doris’ sixteenth birthday, and she celebrated her “sweet sixteenth” among friends, all of whom agreed that the trip had been even better than anticipated. A steward’s pounding woke Doris and the Suhr sisters. This was most likely steward Samuel Petty, who was noticed by several passengers pounding on the doors of the liner’s least deluxe cabins (the 500-600 blocks) and calling to their occupants. The steward yelled to them through the door to get their lifebelts and get out on deck. They did not bother to dress. When Doris stepped into the hall, she found that it was filling with smoke that, to her, seemed to be coming from out of the lighting fixtures. She found Mrs. Byrne, and the Stemmermanns. They all joined hands and walked up the stairs to the aft end of B deck, and then attempted to climb to A deck and the lifeboats. From where they stood, the flames over A Deck, pouring out of the destroyed skylight in the lounge, looked as if they were a mile high. The smoke blew back over them, and they began to choke. It seemed as if Marie Byrne was about to collapse. The two married woman and the two teenagers climbed the rail and jumped together, still holding hands. The impact with the water separated them, and Doris found herself drifting away from the ship, alone, in the dark. Marjorie Budlong, Doris Wacker and Rosario Camacho ran aft along the A Deck starboard corridor, a section of the ship from which they would be the only survivors. The occupants of the next cabin aft of Rosario‘s, Dr and Mrs. Strauch of Donora, Pennsylvania, would die, as would Mrs. Caridad Saenz and her three children, the occupants of the two staterooms aft of the Strauches. Miss Budlong noticed two men in the corridor, but did not comment on whether the men were heading forward towards the fire or aft away from it. They emerged on to the A Deck sports area, in the driving rain. Doris Wacker remarked that she was going to wake her parents, and was told not to attempt it by a crew member. The three friends went down to B Deck, where Doris parted from them and went forward in to the ship to warn her family. Marjorie saw a waiter she knew as “Ralph” putting on a life jacket. When she asked where she could get one, he replied ‘Don’t ask me. I don’t know!’ Perhaps thirty people were already grouped together on the open sports area aft on B deck. Herman and Lillian Wacker, and Doris, appeared, carrying a lifebelt for Marjorie. 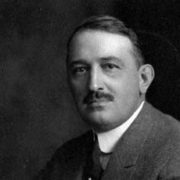 Herman Wacker was the borough engineer for Roselle Park, New Jersey. He and Lillian had taken many cruises and were not impressed by the Morro Castle. They stood with their daughter and her friends in the crowd, which jammed tighter together as the smoke and heat increased, and waited for orders that never came. George and Charlotte Whitlock emerged, late, on to the covered promenade on C Deck. Everybody was tightly jammed in, and some were screaming and hysterical. They saw a pair of stewards, but no officers. Slowed by Mrs. Whitlock’s leg, they were among the last to emerge, and realized that because of the intense fire directly behind them, they could only progress upward. George climbed up to B Deck, alone, and found conditions there worse. He returned to his wife on C Deck. Some of the people in the crowd were yelling ‘Get rid of your clothes!’ Others seemed on the verge of panic. 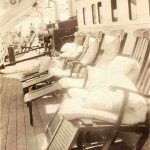 In the days following the fire, several passengers recalled seeing the Whitlocks standing calmly together, while others recalled George Whitlock attempting to maintain order in the mounting chaos on the C Deck promenade. Among the passengers standing close to the Whitlocks were 23 year old Alice Desvernine of Jersey City, New Jersey; her aunt, Mrs. Florence Brown of New York City, and her cousin, Madeline Desvernine of Tuckahoe, New York. The Desvernines were related to the Pillsbury family, and Madeline, 18, had spent the summer of 1934 at their expansive ranch outside of Havana where, among other things, she learned how to swim. Alice and Mrs. Brown sailed down to meet Madeline at the end of the summer, and all three were returning home aboard the Morro Castle. Alice was awakened by either the sound of panic in the hall outside of cabin C-244, or by the smell of smoke. She was not sure, later, by which. No alarm sounded, and from her berth she could see the red glow of the fire reflected against the sky. Terrified, but at the same time remaining calm, she woke up her aunt and then crossed to the port side cabin Madeline shared with an unknown woman to be sure that her cousin was awake and effecting an escape. Madeline would later recall her cabin mate shaking her awake and saying ‘You’d better get up. The ship is on fire,’ so, by the time Alice arrived, she had already grabbed her life preserver. When the Desvernines returned to C-244, and their aunt Florence, they observed that great crowds of panicked men and women were forcing their way back towards the stern. All three women took the time to put on their life preservers before stepping out into the mob. None of them knew how to adjust a life belt properly, and initially put them on too low. A male passenger in the corridor stopped them and fixed the preservers so that they were at the proper height. They attempted to climb the aft grand staircase to B deck but were driven back by flames. They found the C deck promenade in chaos. Passengers rushed about, or crowded together. Some cried, others screamed, and a few seemed frozen with fear. The three women watched crew members fighting the fire with a single hose. By this time the electricity had failed, and Alice would later remark on the flickering red glow the flames cast over everything and everyone trapped on the fantail. They knew that people were beginning to jump, and Alice suddenly found herself wondering what had become of the Saenz children, whom she had informally baby-sat on deck the previous day. George and Charlotte Whitlock drew near. They were voyage friends of Miss Desvernine and Mrs. Brown. George had strips of wet fabric, and wet handkerchiefs, which he was distributing among the trapped passengers and crew. He gave one to each of the women, who held them over their faces to filter out some of the rapidly thickening smoke. James Flynn and Miss Conroy watched the fire burst out on to the port side B Deck promenade and begin rushing back at them along the ceiling. They crossed to the starboard side of the ship, where the wind seemed less fierce and the fire did not spread as quickly. They stood together and watched a lifeboat being lowered. Neither had a life jacket, neither felt it wise to enter the ship to get one, and no one from the crew came along to help them. When the heat and smoke became unbearable, they went over the railing with one of the large Morro Castle life rings and, miraculously, did not lose it when they hit the water. The two clung to it as the burning liner moved away from them. Ann Conway, Floride LaRoche and Florence Roberts waited by boat 10 on the port side of A Deck. The boats forward of where they stood were on fire, and smoke and flames were coming out of the windows of the cabins and upper level of the lounge. Fire was also coming up over the side of the ship from the Promenade Deck below them. Their friend, Louise Taubert was missing. She, Miss LaRoche and Miss Roberts had been awakened by Ann Conway’s pounding. Ann warned them that they had no time to dress and so they grabbed only life preservers before leaving C-219. Miss Conway noted that Gouverneur Morris Phelps Jr. and another passenger were fighting the fire at the Grand Staircase with a single hose. The women’s way to the boat deck was blocked by smoke and flames and so they went back along C Deck to the aft Grand Staircase by the barber’s shop. It was also impassable. A crew member, possibly Chief Engineer Eben Abbott, led them to a crew stairway by which they gained access to the Boat Deck. At some point Louise Taubert became separated from her friends, who would later claim in a pair of interviews that she hung back, frightened by the fire that was pouring out on to the boat deck, and was lost as the other women ran aft towards the crew members gathering around boat #10. The three women and perhaps eleven crew members entered the boat. There was great difficulty in lowering it, and at one point it jammed on the falls. 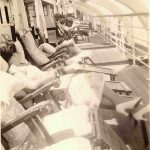 Broken glass from the Promenade Deck windows rained down on the occupants, and Miss Conway pulled a tarpaulin over her head to protect herself from it. There was no plug in the boat and it began to fill, until a sailor removed his shirt and jammed it in to the drainage hole. The boat passed the stern of the Morro Castle, and Miss Conway noted that the passengers and crew gathered there were waving to them. The oars were soon lost overboard, but the crew hoisted a sail and #10, with fewer than 15 people in, it set off for the clearly visible shore. 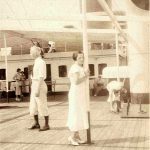 Among the passengers waving at the occupants of #10 as it passed the stern of the liner, were Alexander and Frieda McArthur. They had gone aft on C Deck, and after the electricity failed, observed that the center of the ship was glowing. They remained on the C Deck fantail for perhaps ¾ of an hour, and when conditions became intolerable there, went down a deck to the small open area at the rear of D Deck at the orders of a crewman. Conditions on D Deck were as bad as they were on C. It was crowded, and waves of smoke choked the people who were trapped there. The McArthurs waited for orders, but none came. Mrs. McArthur noticed boat #10 as it passed. She hoped others would come, but they did not. The smoke continued to thicken and passengers began to go over the side. Alexander McArthur insisted that they jump, and although Frieda did not want to, there seemed to be no other options, and so she went. The couple held on to one another in the water, and while they were still in the circle of light from the burning ship, noticed their friends, the Wackers, in the water near them. But, the couples soon lost sight of one another as the wind and tide carried them away from the ship into the pre-dawn murk. James and Ellen Kennedy watched the lifeboat, while it was still plainly visible in the light from the burning ship. She could see the white suits of the crew. Passengers and crew at the stern called its occupants, who seemed to Mrs. Kennedy to be rowing for dear life. They saw another boat off to the side of the Morro Castle, but it did not stop, either. The Kennedys had gone first to B Deck, where they observed that the smoke and fire would change directions as the ship moved with the wind. When B Deck became uninhabitable, the Kennedys went down to C Deck, where Ellen felt they were caught like rats in a trap. They could see the lights of New Jersey off to the left. At some point, James Kennedy, who could not swim, gave his lifebelt to a young girl who did not have one. As the smoke began to choke them, James grabbed his wife, kissed her, and then lifted her over the rail and dropped her. Israel Rudberg watched #10 lowered from further back on the boat deck. The gymnasium was beginning to burn, the amidships portion of the deck was blazing fiercely, and he noted that the flames would change direction as the ship drifted with the wind and tide. No one seemed to be in charge. He observed that people were jumping from both A Deck and B Deck, and that in many cases their life preservers came off as soon as they hit the water. Once the gymnasium was afire, he climbed down to B Deck. B Deck was crowded, smoky, and as lacking in leadership as A Deck had been. 18 year old Ramon Ferner, of Lyndhurst, New Jersey, had gone to sea to work as a wiper aboard the Morro Castle after graduating from Lyndhurst High School. On the night of the fire, he found himself forward on the starboard side of A deck, where crew members manned hoses, pulled trapped passengers from the windows of the deluxe cabins lining the boat deck, and prepared the lifeboats for lowering. Ferner was among the group of crew members, and three passengers, who entered lifeboat #1. The davits aboard the Morro Castle were automatic, and boats could be lowered without the need for a crew member to remain behind on deck. However, #1 jammed in its falls soon after lowering commenced, and Ramon Ferner climbed back aboard the ship to free the boat. What happened next was described by nearly everyone in #1 in their testimony, with some giving brief, abbreviated versions and others becoming quite graphic. Ferner, in blue overalls, attempted to climb down to where boat #1 waited, either by rope or rope ladder. At a point about halfway down the side of the ship, he either lost his grip or jumped for the boat and missed. Ramon was not wearing a life preserver and did not know how to swim. He floundered, and screamed for help. Boat #1, which had been carried astern and seaward of where Ferner struggled, awkwardly attempted to come to his aid, but by the time progress was made, he had vanished. True- the oars were awkward. And, true- there was a swift current running. But, two points cannot be overlooked. On a night where 67 year old Minnie Likewise successfully swam to safety against the wind and current, none of the men who wore life preservers and watched Ramon Ferner drown perhaps ten yards from their boat even attempted to swim to him. And, lifeboat #1 had a motor. Eva Fisk, of New York City, and her cabin mate, Miss Frances Spector of Brooklyn, jumped from the Morro Castle together. There was only one lifebelt in their cabin, and Miss Spector never found one for herself before smoke forced the two women overboard. A lifeboat, under control, appeared from out of the storm, and Miss Fisk never forgot the moment when a crew member in the boat made direct eye contact with her as they passed without slowing down. Frances Spector, without a lifebelt, weakened and drowned. Mrs. Catherine Phelps, of New York, survived to testify that as she was struggling in the storm, lifeboat #1 passed close enough to her that she was able to clearly recognize Chief Engineer Abbott, whom she had met during the voyage, in his white uniform. Eleanor Brennan‘s party came to a disastrous end. The knock at her stateroom door was not room service, as expected, but someone who called out ‘fire’ to the partygoers. Eleanor ran aft with Helen Brodie and Agnes Berry to their cabin, C-273, to grab their life preservers, accompanied by Father Egan. They ran into cruise director Herman Cluthe in the aft lobby by the Barber Shop. He told them to be quiet. They smelled smoke but saw no fire. The four climbed up to B Deck. They found B Deck to be a mass of flames and screaming people. They climbed down again to C Deck and to what Helen would later describe as bedlam. Two members of the crew were fighting the fire with buckets. Some of the passengers were hysterical. From the rail, the three women watched a lifeboat row along the side of the ship perhaps 8 feet out. It did not stop. Father Egan gave Conditional Absolution and the three women, all Catholic, drew close to him. Later, Helen would describe him as being the only calming influence on the deck. Some members of the crowd screamed ‘Jump! Jump’ while others screamed out not to. The heat increased and the smoke choked them and burned their eyes. Eleanor, Helen and Agnes climbed the rail and jumped together. The impact tore them apart from one another, and the 35 mph wind carried each woman away, alone, into the dark. Helen Brodie drifted, for several hours. She came across Eleanor Brennan in the water, but by that time Eleanor was in terrible condition. She clung to Helen’s life jacket and on at least two occasions muttered that she could not hold on. An airplane, probably occupied by New Jersey’s Governor Moore, repeatedly circled them and dipped its wings. This was to indicate their location to the fleet of fishing boats that was working against time to save people who had been carried closer to shore than where the lifeboats from the three rescue ships were searching. Eleanor was exhausted, and her reaction to the plane circling close overhead was hysteria. A boat diverted course and approached Miss Brodie and Miss Brennan, led by the plane, but at the last minute a large wave swept over the pair and Helen felt Eleanor torn away from her. Within five minutes, Helen Brodie was safely aboard a rescue craft. The Clemens Landmann family, in C-241, was awakened by their neighbors George Sivation and Henry Zimplinski from cabin 239. They heard neither the explosion nor an alarm, if any sounded in their part of the ship and their only warning came from the two men who pounded on their door and called to them that there was a fire. 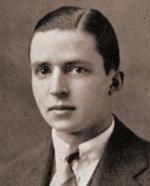 George Sivation, a pharmacist from suburban Philadelphia, would survive, while Henry Zimplinski would die of exposure. The Landmanns stopped to dress- they later estimated that it took no more than two minutes. Mr. Landmann would later recall that the hall was full of smoke and water, and that the fire was reflected in the water pooling on the floor. The Landmanns found themselves at the stern of B Deck, with a large number of other passengers. 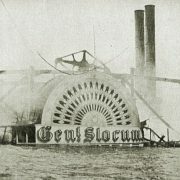 Clemens looked forward and saw the lifeboats hanging unused along the side of A Deck. When he asked a crew member when the passengers would be put into the boats, he was told that it would not be necessary- rescue ships were on the way. Within ten minutes, the fire had burned through the rear of A Deck, cutting it off from those waiting below on B and making escape by lifeboat seems impossible. The Wackers and Marjorie Budlong jumped from the ship together. They had been ordered to C Deck by either cruise director Smith, or Assistant Cruise Director Cluthe, and remained there until the smoke became intolerable. They climbed the rail together, but someone pushing from behind knocked Marjorie from the ship, away from the Wackers. And so the family came up together in the water, but their friend was nowhere to be seen. As the Wackers were struggling to stay together, Edward and Adele Brady were witnessing the most horrible thing either had ever seen. Soon after entering the water, they came across Ann Conway’s card playing friend from the voyage, Morton Lyon. He had broken his neck jumping from the ship in a life jacket, but the blow had not killed him instantly, nor had it rendered him unconscious. His head lolled, and he struggled to breathe. Mr. and Mrs. Brady held him until he died, and then released his body and he drifted away, kept afloat by his life jacket. Dr. Francisco Busquet, Chief Radiologist of Emergency and Polyclinic Hospitals in Havana, his wife, Ofelia Hernadez, 34, and teenage daughter, Ofelia, were stunned and practically knocked out when their life preservers rammed up under their chins as they hit the water. Miss Busquet had been awakened by the noise of the fire. She and her parents had donned life preservers and, after leaving their cabin, heard the massive explosion commented on by many survivors. They stood together at the rear of C Deck and watched the storm, noticing that there were occasional flashes of lightning in the distance. When the smoke became too thick, the family jumped and were nearly killed by their life jackets acting as nooses. When all three recovered from the blows each took to the head, they joined hands with one another and waited. Angelus Cortez D’Orn, a friend of the Busquets who had traveled with them several times in the past, narrowly escaped with her life from A- 16, the port side mirror image cabin to Rosario Camacho’s. Mrs. D’Orn was an American, from Columbus, Ohio, who had married a French citizen and settled in Havana. She traveled without her husband on this voyage. Her stylish Whippet dog stayed in her A Deck cabin~ the first room reached by the fire on the port side. Unlike Miss Camacho, Mrs. D’Orn did not have the advantage of being awake as the flames from the lounge blew back and upward on to A Deck. She apparently awoke as the fire entered her cabin. She escaped out the window, on to the boat deck, with serious burns on her face and arms. Her Whippet died in the cabin. Roberto Gonzales, 13, occupied A- 18, the next room aft of Angelus D’Orn’s. Roberto should not have been aboard the Morro Castle. His father, Isidore Gonzales, was the general manager of United Fruit, Havana. Roberto’s parents wanted him educated in the United States, and so during the school term he lived with his uncle and aunt, Mr. and Mrs. Joseph Jova, in Newburgh, NY. The Jovas were socially prominent, and Roberto became popular among the younger set at the tennis court and pool of the Powellton Club. Roberto, and his cousin, Henri Jova, spent the summer of 1934 in Cuba. Isidore Gonzales arranged for his son and nephew to return to New York aboard a United Fruit vessel, the Quirigua, sailing for New York on September 5th but when they arrived at the pier it was to discover that a booking error had been made and only one of the boys could be accommodated. So, Roberto was switched over to the Morro Castle while Henri kept the original reservation. Roberto had as little time to escape as Mrs. D’Orn. Within ten minutes of the fire’s entrance into the lounge, the aft corridors on A Deck were impassable. But, Roberto had an advantage the other passengers on A Deck did not. For some reason, his cabin opened on to the boat deck and not in to the hallway, the only cabin aboard the ship so equipped. He was only steps away from Boat #10 and so his chances of survival seemed good. Two doors down from Rosario Camacho’s A Deck cabin, Mrs. Caridad Aguilera Saenz and her son and two daughters did not have the split second stroke of luck that spared Angelus D’Orn. Caridad was the wife of Dr. Braulio Saenz of Havana. A 1927 passenger list from the Olympic allows a glimpse of the Saenz family’s lifestyle: they traveled en suite, along with Caridad’s mother and brother, and the children’s nurse and a governess. The Saenz y Aguilera children were educated in Boston, and each year Caridad would accompany them north, usually traveling by train from Miami. Caridad and her daughters Margarita, (8) and Marta (11) occupied cabin A-23, while her 13 year old son, Braulio, occupied A-21. When the family awoke, it was to discover that their cabins were already on fire and they were trapped. Deck series taken from the location of the Saenz’s cabin. Caridad Saenz burned to death in her cabin, where a few bones were later recovered from the floor. 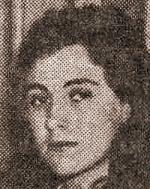 Marta Saenz y Aguilera, horribly burned on her face and arms, jumped from the ship without a life preserver. She wore a pink nightgown. She swam up to Steward Charles Wright, who bound her to his own life jacket. They drifted with a large group of other passengers and crew members, many of whom later commented on ‘the badly burned girl in the pink nightgown.’ Wright recalled that her face was scarred by the fire and that she was trying not to cry or whimper. She died after sunrise and Wright reluctantly let her body go. * Photo of Morton Lyon courtesy of Williams College Archives and Special Collections, Williamstown, Mass., USA. David Schneider crawled aft along A Deck under the smoke. At the top of the stairs between A and B Deck he found a burned Cuban girl who wore a plaid patterned silk dress. It had to have been Margarita Saenz. Marta wore a pink nightgown, and Schneider, who was in the textile business, was emphatic that the young girl wore plaid silk. 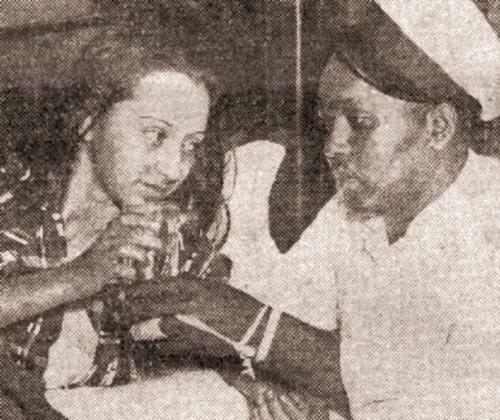 There were no other Cuban girls quartered on A Deck, except for Rosario Camacho, and none of the three Cuban girls who survived the disaster were burned. He carried Margarita down to B Deck and then aft. From there, the burned Cuban girl vanished from his narrative. He later recalled that all he could hear was hollering and screaming. He ran in to Rosario Camacho, Franz de Beche and Joseph Hidalgo in the crowd and noted that only she wore a life jacket. The smoke was very dense, the deck was crowded and he later admitted to throwing people off. He was afraid that he would be crowded overboard, and so went from B Deck down to C and from C to D.
Clara Siegmond, 58, from Bardonia, New York, would later recount her most horrifying memory of the Morro Castle disaster as being the sight of the passengers trapped in midships cabins along C Deck forcing their way out of the portholes and tumbling into the ocean. Mrs. Siegmond, in cabin D-333, was one of the very few passengers to later mention hearing the ship’s alarm system sounding. She and her cabin mate, Miss Emily Beck, of Philadelphia, were awakened by a bell loudly ringing somewhere near their cabin. They dressed and went to investigate. When they discovered that the ship was afire, they took the time to return to their cabin and retrieve their pocketbooks. The electricity failed, and the two women walked forward toward the fire until they were directed sternward by a crew member. Both women were horrified by the confusion on deck and, as already said, by the sight of people trapped in their cabins struggling to save themselves. When the smoke began to make them sick, Mrs. Siegmond and Miss Beck slid down ropes from the stern, and clung to one another in the water as they were washed away from the ship. 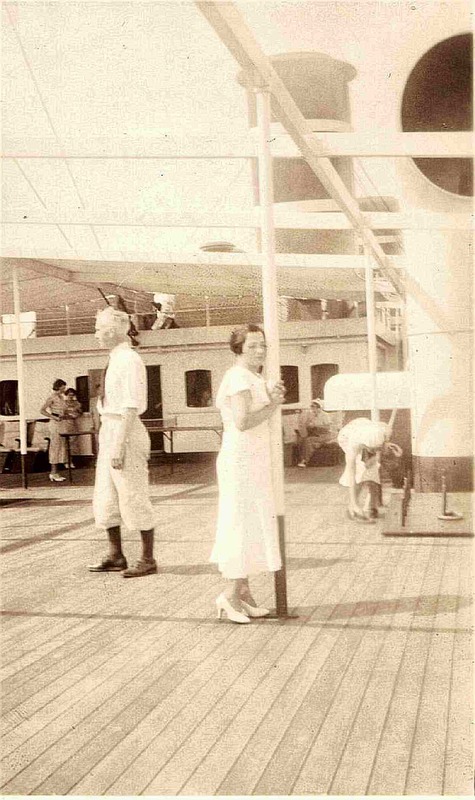 Charles and Selma Filtzer remained on B Deck for as long as possible. Selma noticed that the direction in which the smoke was blowing changed. Sometimes it blew across the ship from port to starboard, while other times it blew aft. When conditions became suffocating on B Deck some passengers began to jump, while others walked down to C Deck using a crew stairway. The Filtzers went down the stairs of their own accord- there were no orders or instructions given by the crew as far as they knew. On C Deck the Filtzers felt as if they were going to be crushed or suffocated. People were climbing down from B Deck, climbing upward from the smoke filled confines of D and E Decks and emerging, at the last minute from the cabins along C. Smoke and ash and flaming flakes of paint blew back on the crowd. The heat seemed intolerable, and after about five minutes the Filtzers climbed the rail and jumped together. Sidney and Dolly Davidson, of The Bronx, clung to one another as the storm carried them away from the burning liner. The Davidsons were on their honeymoon, and occupied the larger of the two cabins of suite 235/37, but in no accounts did either mention making the acquaintance of their suitemate, Eleanor Brennan. They were awakened that morning by shouting and the sound of people running in the corridor outside of their room. They ran to the C deck promenade, where a man helped Dolly overboard, and from where Sidney jumped. The Davidsons swam together to a group of perhaps 25 passengers clinging to one another some distance from the ship. For the rest of her life, Dolly would remember one specific member of the circle-a little girl in a pink nightgown, with long black hair, who was burnt all over. Dozens of corpses drifted by the group, and Dolly found herself repeating “I won’t die! I won’t!” as the current carried the group towards shore. The passengers and crew joined hands, and sang for a time, to keep occupied. Clemens, Jose and Marta Landmann found themselves trapped by thick, choking, waves of smoke. They had gone below to C Deck when conditions on B Deck worsened. A small semblance of order was observed by Clemens~ women and children were escorted below first. A few minutes later he climbed down as well, and found his family. The smoke poured back, directly over them. He noted that it was thick and black. The cabins only a few feet from there they stood were beginning to burn, and so he helped his wife and daughter over the rail, joined them and they pushed off from the ship with one another. Abraham and Harriet Cohen and the Vitales were trapped at the rear of the crowd on C Deck, where the smoke and the heat were worst. The Cohens noticed that a portion of the crowd remained calm by singing ‘Hail! Hail! The Gang’s All Here’ but those furthest from the rail were beginning to become demoralized. Abraham recalled a crew man standing nearby and crying. The Cohens’ eyes burned and they felt themselves choking, so Abraham grasped Harriet by the shoulders and they pushed their way into the crowd, towards the rail. They jumped, and were momentarily stunned by the impact. Then they found one another in the water. Abraham’s life jacket was not fitting properly, and they swam to a group of passengers who were clinging to one another. A man helped adjust Mr. Cohen’s life preserver. The group soon drifted away, and the Cohens were alone. They saw no one else from the ship, alive or dead, near them in the water. Loretta Hassall watched a lifeboat, with perhaps 25 people in, it pass about 200 yards from the ship. She found her parents and sister in the crowd, and they stood together on B Deck. Two other lifeboats passed by them, at five minute intervals. The boats rounded the stern, did not stop to pick up passengers, and rowed towards shore. It seemed to Mrs. Hassall that the boats were in control. Mr. and Mrs. Hassall, and Ethel, jumped from B Deck at about 3:40 when the smoke became unbearable. They were separated by the impact and swept away from one another. Loretta Hassall climbed down to C deck, and remained there until 4 AM, when the heat drove her overboard. George and Charlotte Whitlock watched flames pour out of the doors and windows directly behind them on C Deck Two crew members threw streams of water at the fire from hoses. A man fell unconscious to the deck. Passengers and crew climbed on to the rail so that they could breathe better, hindering access for those behind them. Many of those who climbed on to the rail were pushed over by others desperate for air. There was no command or order to jump, but the smoke was so thick and choking that many did, anyway. The pressure to the hoses, which had been weak to begin with, tapered off and finally the streams of water ceased entirely. The Jakobys and their friends stood in the crowd aft on B Deck. The smoke was thick and choking and the deck heated up under their feet. For a time, crew members and passengers were “helping” others by lifting them up and throwing them over the rail. Marie Renz became the first from their party to die. She was not wearing a life jacket and could not swim. Despite her protestations, and those of Mr. Renz, she was picked up and tossed overboard by would-be rescuers, and she immediately drowned beside the ship. Henry Jakoby, Jr. helped his mother over the railing. They stood beside one another on the outside of the rail. They apparently slid down one of the ship’s lines, and the impact with the water injured Mrs. Jakoby’s spine. She noted that the water was cold and that it was still raining. Henry Jr. kept her afloat as they swam away from the liner. 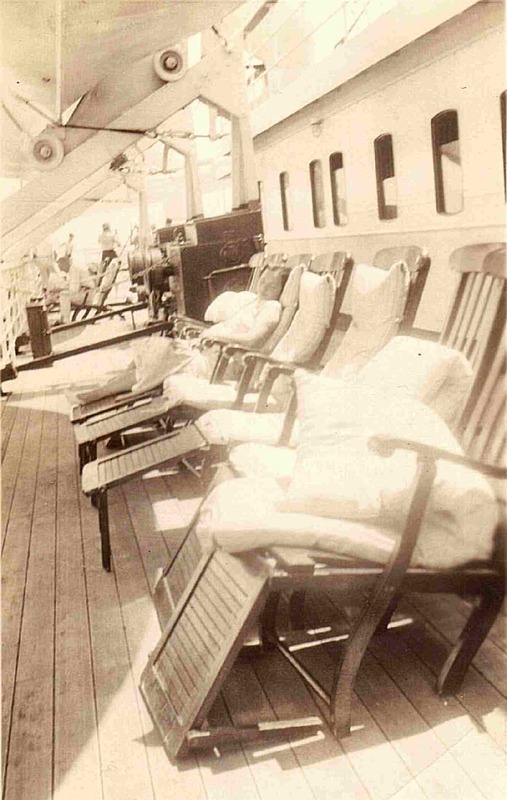 Betty Sheridan of Wilkes-Barre, Pennsylvania, waited with her brother, Thomas Featherstone, and her eight year old son, Arthur, on one of the enclosed decks at the stern. She had been awakened by the smell of smoke in her cabin, C-261, and roused her brother and child. She dressed herself and Arthur, partially, and stepped out in to the corridor, where it seemed that everyone was screaming. All three took their life preservers and headed aft. For a time they were on B Deck, and then went lower to escape the heat and smoke. There were no lights, and Arthur began to smother. She stood him on the railing where he could breath, and when conditions continued to worsen she pushed him overboard and leapt after him. Dr. James Borrell and his wife, Henrietta, stood at the stern of the Morro Castle and watched the fire advance towards them. Dr. Borrell was the president of the Erie County Medical Society, in Buffalo, New York. He and Mrs. Borrell had decided on a spontaneous and romantic vacation, and left Buffalo in their automobile at the end of August with no definite plans other than to drive to New York City. They wanted to take a cruise to either Cuba or Bermuda, but also discussed a New England motor trip or simply remaining in Manhattan for a week. They chose Cuba, and left their car parked at the Biltmore Hotel garage when they departed aboard the Morro Castle on September 1st. Mrs. Borrell carried over $3800.00 worth of diamonds with her. They occupied cabin C-259. A steward’s knock awoke Dr. and Mrs. Borrell. When they fled their cabin, flames were already visible in the hall. They stood at the stern for almost an hour, until conditions became unbearable. The Borrells argued about who should jump first. Dr. Borrell wanted Henrietta to jump, and he would follow her in and find her once he knew she was safely off the ship. Henrietta wanted him to jump, and she would follow knowing that he would immediately swim to her once she was in the water. A crew member ordered them to jump, and they climbed the rail together. Henrietta went first, as it turned out, with her husband following. He could not find her in the churning water and was soon carried away from the ship, alone. Dr. Henry Strauch, 41, and his wife, Ruth, 24, were also aboard the Morro Castle because of a spontaneous decision. Henry Strauch worked as a pharmacist as a young man and from there entered Thomas Jefferson Medical College in Philadelphia. He graduated, at age 35, and while serving his residency at West Penn Medical Center met young nursing student Ruth Rose, of Donora, Pennsylvania. Ruth was from a large working class family ~ her father was employed by a mill ~ and was eager to make her way in the world. Henry and Ruth married in 1930, after which he established his practice in her home town. 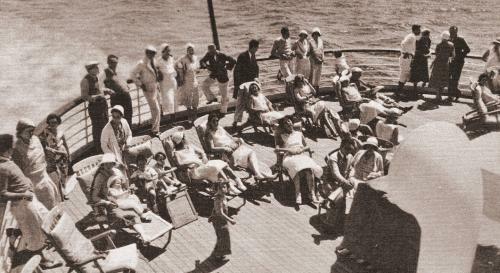 They planned a sea vacation for themselves at the end of the summer of 1934, but could not decide whether a voyage to Bermuda aboard the Monarch of Bermuda, or a cruise to Nova Scotia, was the more appealing vacation. Henry took a business trip to Pittsburgh, and while there spontaneously booked himself and Ruth aboard the Morro Castle bound for Cuba. Ruth sent a letter and several postcards home to her family while the ship was in Havana. Her mother received a note written on Ward Line letterhead and dated September 2, in which Ruth wrote glowingly of the good time she and Henry were having and of her plans to attend the masquerade ball that evening. Dr. and Mrs. Strauch died in the disaster, leaving Ruth’s happy postcards home as the last record of the couple. Their cabin, A-19, was between those of Miss Camacho and Braulio Saenz, in the stern starboard corridor on A Deck. But, when Ruth’s father and brothers identified their bodies neither had been burned, indicating that they were likely still awake and not in their cabin when the fire swept into A Deck. One wonders if they were still alive at the point when the Monarch of Bermuda – the liner they could have been aboard ~ arrived on the scene at daybreak and anchored perhaps 100 yards from the burning Morro Castle. Dr. James Coll, 50, head of the Modern Medical Associates Clinic in Jersey City, New Jersey, was aboard the Morro Castle with his wife, Dorothy, 23, and his guests Dr. and Mrs. Jules Blondiau and George Watremez. 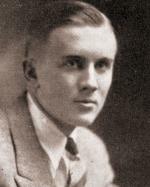 Dr. Blondiau had worked with Dr. Coll before relocating to Philadelphia and his cousin, George Watremez, 18, continued to work for Dr. Coll as his chauffeur. The traveling party occupied three widely spaced cabins and, oddly, James and Dorothy, who paid for the excursion, occupied the least desirable of them. Stateroom 328 was one of a group of three deluxe cabins set into the middle of the ship’s “low rent district” on D-Deck: the cabins were an entirely enclosed unit that had no access to D Deck and could only be reached or departed from by means of a single small flight of stairs up to C.
Dorothy Coll later remembered that George Watremez came to their cabin to awaken them. The electricity failed while they were still on D Deck, but they found their way up to the stern of C Deck where they met Dr. and Mrs. Blondiau. There was much pushing and jostling and no direction, and the crowd forced Mrs. Coll away from her husband and friends. She freely admitted to becoming ‘hysterical,’ for she could see her husband through the smoke and crowd, but could not reach him. She watched as he jumped from the ship. When the fire worsened and the crowd thinned a bit, Dorothy made her way to the rail and jumped as well. Dr. Jules Blondiau and his wife, Martha – nicknamed “Margie”- were awakened by the panic in the hall outside of their cabin. They grabbed their life jackets, and Martha took her silver fox stole, before they fled for the stern. Martha had been a singer with an orchestra in New York City. She and Jules met in a nightclub and were married in a civil ceremony within a week. Despite the roaring twenties flavor of their courtship and wedding, the marriage worked. They ran into Jules’ cousin, George Watremez, who was coming down the corridor to find them and, later, when he returned with Dr. and Mrs. Coll, the touring party was briefly reunited. Dr. Blondiau later recalled Dr. Coll remarking ‘It’s going to be tough.’ He and Martha also recalled the crowd singing ‘Hail! Hail! The Gang’s All Here’ to bolster spirits as the fire moved closer. George Watremez recalls the scene aft on B and C deck as being hellish. He woke up that night to see the reflected light of the fire outside of his porthole and hear the panicked crowd outside the door to his cabin, C-277. He describes Dr. Coll as being a nice man and a good employer, who was also a binge drinker. Dorothy Coll was a good person, who he remembers as being a farm girl from the vicinity of Fort Dix, New Jersey. 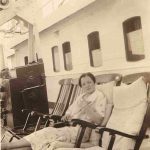 Of all of the Morro Castle’s passengers, it seems that Dorothy Sooy Coll’s origins were the most humble. The 1930 census for Browns Mills, New Jersey, shows the Sooy family as being the only one on a list of neighbors nearly two pages long in which members were employed and had listed occupations. How she came to Jersey City, and met and married the Doctor is unknown, but George Watremez remembers that James Coll would affectionately introduce Dorothy as his ‘fifth wife’ (which she was) to which she would pointedly add ‘and your last wife.’ George delayed his escape to the open deck in order to make sure that the Colls were awake and free of their all-but-inaccessible cabin. Once on deck, he was soon separated from his boss and his cousin. He went up to B Deck, and watched the superstructure burning forward of where he stood. Passengers were jammed tight together, and many were beginning to remove their outer clothing and shoes, preparing for the inevitable jump. George did not know how to swim, but had a life jacket. When conditions became intolerable, he jumped from the area of B deck closest to the liner’s stern flagpole. Anne Behling would later recall jumping for her life from beside the B deck flagpole as well. She had been one of the first passengers to arrive on the sports area aft of the gymnasium on A deck, but soon dozens of passengers and crew swarmed up from below and crowded around her. She observed that the crew members who arrived on A deck seemed to have just rolled out of their bunks and were adjusting their clothing. From where she stood the whole forward end of the boat seemed to be on fire. The lights of the Jersey shore were clearly visible. The Morro Castle was still under way. When the smoke on A Deck grew too thick, Miss Behling went down to B Deck, where she found perhaps one hundred people, confused and excited, jammed together. There was no one instructing the passengers on what to do, but she did observe that one hose was being worked on the port side of the deck. Two lifeboats passed while Anne watched. One seemed very crowded while the other did not, and both quickly disappeared into the darkness. The volume of smoke pouring over the crowd became so great that Miss Behling began to feel as if she was in danger of suffocating, and so she climbed the rail beside the flagpole and jumped, pushing herself away from the ship. Lillian Davison, a vacationing nurse from Columbia Presbyterian Hospital in New York City, was awakened by pounding on the door to the cabin, C-266; she shared with fellow nurse Martha Bradbury. Smoke was entering the room through the open porthole, and they could hear shouting and screams from the hall. Lillian had been on her own since 1926, when she survived a railroad crossing car accident that killed her father, Dr. Elwyn Davison, her mother and her brother. Bedridden for a year, she pushed herself to recover. By 1934, she had been working as a nurse for over a year. She and Martha were due back on duty at one in the afternoon of September 8th and so, presumably, had retired early. Whomever pounded on their door called out ‘Put your life jackets on and be ready!’ The two, knowing it was an emergency, reacted calmly, placing their life preservers on over their nightgowns and walking aft to the open area at the rear of B Deck. 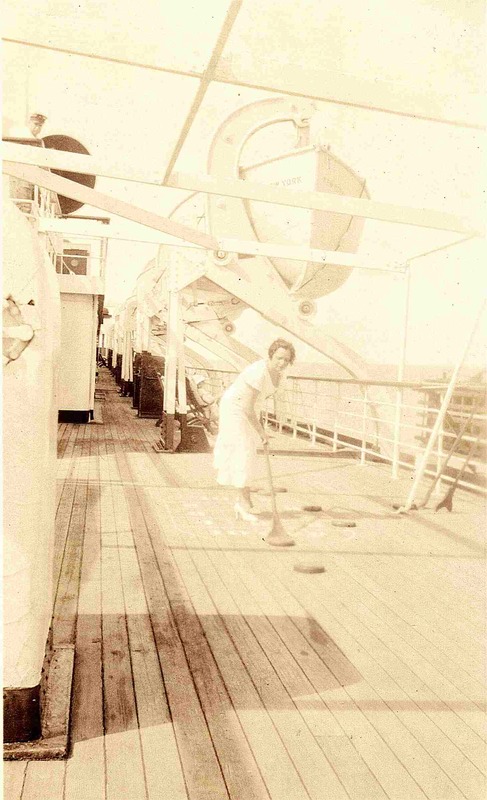 Lillian noted that at the time they arrived on the sports deck there was no panic- just a sense of urgency. When the smoke began to choke those who waited on B Deck, Lillian and Martha were among those who were ordered to go below and try to make their way forward. The intense heat, smoke and flames made it impossible to enter the ship on C Deck. No attempt was made to go forward. The two friends joined with the crowd of passengers who stood on the C Deck fantail and sang ‘Hail! Hail! The Gang’s All Here’ as the smoke began to thicken and the small aft lounge began to burn. Rosario Camacho separated from Marjorie, Doris, and the Wackers before they jumped from the ship. Cruise director Smith ordered her down to C Deck, where she met her friends Franz Hoed de Beche and Joseph Hidalgo. Joseph, 19, was en route to Lehigh University, in Pennsylvania, while Franz, 18, was returning his aunt’s apartment on West 116th Street in New York City, where he lived while attending De Witt Clinton High School. The two shared a cabin with one another, and like so many others, had been awakened by a pounding on their cabin door. After looking out of their porthole and seeing the upper decks of the ship in flames, they grabbed life preservers and headed aft to the open deck. Each wanted to give Rosario his life preserver, and Franz prevailed. He was a champion swimmer in both Havana and New York City, and felt that of the three he was best able to survive in the water without one. He and Rosario set out to find another life jacket, and Joseph Hidalgo went down one deck to the open area at the stern of D Deck. Rosario and Franz encountered an officer on C Deck. Rosario asked the officer when the boats would be lowered and he answered ‘God only knows, madam, don’t get upset.’ Smoke poured out of the doors leading out from the superstructure, choking the two young friends. They went towards the rail together, but their way was blocked by a large man who was able to lean out and breath relatively fresh air. They pulled at him, but he would not move. Rosario felt that she was about to suffocate, and bit the man on his upper back. He whirled around, and she and Franz de Beche pushed past him and climbed the rail. They planned on holding hands and jumping, but before they could, somebody struck them from behind and they fell from the ship separate from one another. Miss Camacho was stunned by the impact. When she came to, she was ensnared by one of the ropes that hung from the ship’s stern. She did not know whether she instinctively grasped at it while semi-conscious, or drifted into it while stunned. She was able to read the words Morro Castle on the stern. Her handbag, with her jewelry, was gone and so, too, was Franz de Beche. Joseph Hidalgo saw Rosario and Franz get knocked from C Deck. He jumped from D Deck hoping to find them in the water, but could not, and drifted in his life jacket with a group of survivors until he was picked up, in a stupor, by a lifeboat from the City of Savannah. Dr. Bregstein and Mervyn first went to B deck. They watched some people with a hose trying to slow the progress of the fire, but the pressure was extremely low and the men were actually shaking the nozzle, in effect trying to “throw” water towards the fire. They went down a narrow stair to C deck. Except for cruise director Smith, who was instructing passengers to head lower into the liner, they noticed no members of the crew. Mervyn asked Robert Smith for a life preserver, and was told to stay close to his father and he would be alright. When the Bregsteins were on B Deck, Joseph noted that the fire was concentrated on the port side, amidships, but soon after they arrived on C, the smoke and embers began blowing back over them and the superstructure began to burn around them. The heat was unbearable. Joseph Bregstein recognized Mrs. Charles Hoffman in the crowd. She was growing faint, and the Doctor aided her. He saw sisters Gladys and Ethel Knight standing by the rail. When he and Mervyn looked through the windows of the small aft lounge, the room was burning like a furnace. People were screaming ‘Jump! Jump!’ as the wind drove the smoke across the crowd. He asked Steward Pond if help was on the way, and Pond replied ‘Don’t ask me.’ Mrs. Julia Rueda stood nearby, with her two sons, Dickie, 3, and Benito, 7. She was crying, and asking people to help her with her boys. The deck burned Benito’s feet, and he was crying that he could not breathe. Dickie was placed into a life ring and lowered from the side, but he fell through it, and was carried away by the storm. Dr. Bregstein began to feel muddled by the smoke. The Knight sisters, who had life jackets, approached him and Mervyn. Ethel offered to take the boy and swim towards the lifeboats with him. Mervyn was choking from the smoke, and it burned Dr. Bregstein’s eyes so badly that he could not keep them open. Dr. Bregstein had to make a decision. He could not swim, and the Knight sisters could. Neither he nor Mervyn were wearing a life jacket, and the Knight Sisters both were. The four went to the side of the ship, but observed that the ropes which hung over the edge were so crowded with people that they could not climb down them. Dr. Bregstein saw Ann Litwak standing nearby. He told Mervyn to hang on to Ethel Knight, and she and her sister would take care of him. Then, the three climbed the rail and jumped together, leaving Dr. Bregstein alone in the smoke. The storm drove Gladys and Ethel Knight apart. Gladys, rising on the crest of a wave, saw Ethel struggling in the water with Mervyn Bregstein several yards away, but could not reach them and soon lost sight of the pair. At some point that morning, she came across Benito Rueda in the water, and held the boy afloat as the waves tossed them. Both would survive, as would Benito’s mother, Julia. His brother, Dickie, became the youngest victim of the Morro Castle disaster. Israel Rudberg saw the Knight Sisters and Mervyn Bregstein jump from C Deck. Rudberg had manned a hose, with members of the crew, for about a half hour, while enough pressure remained to propel the water ten to fifteen feet. He held a handkerchief over his face to filter out the worst of the smoke. There were still no officers present, and still no instructions. Finally, the smoke got so bad he was forced to jump from the ship. Dolly and Sidney Davidson, still in the large circle of survivors, found themselves supporting a very young boy, who said his name was Arthur. They passed him back and forth between one another for several hours, each taking a turn holding him as the other rested. He commented that he felt very sleepy. Then a massive wave struck the group, and Dolly saw Arthur carried away. The Davidsons, and the others, saw him struggling feebly at a distance, and then the storm carried him off. Dolly later remarked that several of the older members of the circle weakened, gave up hope, and died or disappeared as the diminishing group was tossed about. Dr. and Mrs. Weinberger were on C Deck for much of the morning. They witnessed the exchange between cruise director Robert Smith and Mervyn Bregstein, quoting Smith as having said ‘Stay with your father. He will take good care of you.’ Mrs. Weinberger eventually jumped from the ship, while the Doctor remained behind. Dr. Weinberger joined one of the ship’s electricians; Dr. Phelps; and a few crew members in manning a hose. Dr. Weinberger later commented on the great panic and confusion aft on C Deck, and after a time he gave up working the hose and instead took to helping his fellow passengers, and members of the crew. Lillian Davison and Martha Bradbury saw the lifeboats depart or burn on their davits. No officers came to advise them and they realized that they were entirely on their own. Beyond the covered deck they could see that rain was driving down in sheets, and they could feel the ship moving with the storm. They did not know what to do, but knew that in moments they would be overcome by the smoke that was pouring back over them. When they finally jumped, together, it seemed to Lillian that she would never hit the water, and when she struck the water with a surprising impact, she felt that she would never come back to the surface. She and Martha called out, but each could only answer- they could neither see nor reach one another. One would call out ‘Are you still there?’ and the other would answer in the affirmative. Sparks were raining down from the ship, and Lillian knew that they were in danger from the other passengers who were leaping from B and C Decks and landing close to them in the water. Lillian heard someone she assumed to be a crew member calling ‘Help is coming! Help is coming! They have heard us!’ and she noticed that some passengers were still singing ‘Hail! Hail! The Gang’s All Here!’ The storm soon separated her from Martha and she floated alone. Hope, for many, arrived in the form of the liners City of Savannah, and Monarch of Bermuda, and freighter Andrea Luckenbach, all of which arrived close to daybreak. Lifeboats from these vessels combed the water around the Morro Castle, swiftly pulling numbed survivors to safety, and drew in close to the burning ship to pluck survivors from the ropes to which they clung. Sadly, in a night of miscommunications one last major blunder was committed. More than half of those on board the Morro Castle had gone overboard long before the rescue ships arrived on scene. No one took the time to communicate to the Captains and Officers of these ships that many had already drifted off. It was from planes, like that of Governor Moore, that word was finally received of the hundreds of people in the water, fanned out over a great stretch of ocean three miles south and one mile west of the rescue ships. So, in the end, fishing boats played as big a part in the rescue as the large ships did. Planes, flying overhead, circled survivors floating in the water. Some dropped smoke bombs nailed to boards, hoping that the resultant trail would draw the attention of the boat crews. Quite a few of the Morro Castle’s people were strong enough, and determined enough, to complete the six mile swim to shore, but most of those who went overboard before daylight began to succumb to exhaustion and exposure after fighting the storm for five or six hours. The fishing boat crews were fighting a grimmer battle than those of the ships at the disaster site, as dozens began to die in an area of stormy ocean too large to search effectively. Josephine Jakoby and her son were joined in the water by Anthony Lione, of Sunnyside, Queens. Anthony, a bandleader and architect turned insurance salesman, had been given a Morro Castle cruise as a reward for excellent sales in depression-ridden 1934. He and his wife, Mary, and two sons, Raymond and Robert, made the trip together. Their cabin, 603, was one of the least desirable on the ship, but they had the run of the public rooms and the opportunity for an expense-paid family vacation. All four had come out on deck together, and Anthony jumped from the stern with his elder son, Raymond. Mrs. Lione hung back with Robert. They would survive. Raymond Lione was soon separated from his father. Mr. Lione and the Jakobys drifted together for hours, growing numb from exposure. Josephine would not later reveal the order in which it happened, but at some point Anthony Lione died, and so too did her 17 year old son. She witnessed both deaths but did not elaborate on what happened beyond the bare outline. She was alone when she was picked up by one of the fishing boats that combed the water between the ship and shore. Alice and Madeline Desvenine, and their aunt, Florence Brown, remained on the stern, watching the fire gutting the aft lounge and the rain driving down, until after daybreak. The three of them decided that it would be safer to lower themselves into the water than it would be to jump. They climbed hand over hand, or slid, down lines hanging from the stern. The three hung on for a time, buffeted by the waves. A woman drifted by wearing an improperly adjusted lifebelt. It was driving her head under the surface and she was struggling to right herself. Florence Brown let go of her rope to swim to the drowning woman, and both were swept away. Madeline lost her grip on her line and vanished as well. A half hour later, a lifeboat from the City of Savannah appeared and its crew members pulled Alice Desvernine to safety. Madeline Desvernine was carried away from the ship by the long swells sweeping towards shore. She had learned to swim in Havana, and the knowledge that she was not entirely helpless kept her from giving in to panic or despair. Twice, lifeboats rowed passed her and missed seeing her as she vanished into the trough of the waves, but then a third lifeboat crew -from the City of Savannah– spotted her while she was on the crest of a swell and soon pulled her in. Loretta Hassall clung to a rope hanging from the Morro Castle’s stern. She did not know where the other three members of her family were. She hung on to the rope, as the waves pulled at her, for five hours. A lifeboat from the City of Savannah reached her at 9 AM. Rosario Camacho, still holding on to a line, was rescued a short time later by a lifeboat from the Andrea Luckenbach. She observed that her watch had stopped at 4:15. Nearby, a lifeboat from the Monarch of Bermuda pulled Anthony Lione’s widow, Mary, and their surviving child, Robert, from the ropes to which they had clung for five hours. Alexander McArthur was a strong swimmer, while Frieda could barely tread water. Mrs. McArthur fought to swim, and her husband held her head above water for several hours. After daybreak, the wind had reached a sustained speed of 35MPH with substantially stronger gusts, and the waves were long, high rollers. Even with a lifebelt, remaining above water in those conditions was exhausting and Mr. McArthur eventually slipped into a stupor and then fell unconscious. He did not revive, and when later in the morning Mrs. McArthur was found by an airplane which led the Paramount to her, she was paddling with one hand and holding her husband with the other. She did not know if he was unconscious or dead, and the crew of the Paramount spent ten minutes pleading with her to release his body and come aboard. Finally, she did, and climbed aboard the fishing yacht crying as her husband, the father of her two children, was carried away by the storm. She was never entirely confident that he was dead when she let go. 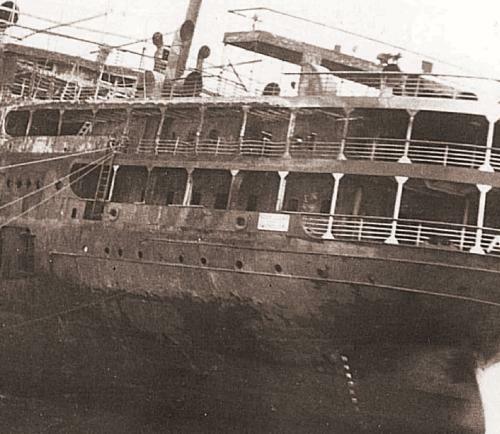 Abraham and Harriet Cohen started swimming away from the Morro Castle, almost immediately after entering the water. When one tired, the other would continue to tread water as the tired one held on to his or her life preserver and rested. In that way, neither became completely exhausted. When they felt the onset of despair they spoke of their families at home in Hartford, and how it was important to continue onward for their sake. Shore had been visible the entire time, first only as lights on the horizon, and then as day broke, as clearly defined land and buildings. When the Cohens looked back they could see the Morro Castle sullenly smoking in the distance. Ahead of them they could see the hotels and cottages of Spring Lake. They continued to swim towards shore. The Cohens’ friends, Mr. and Mrs. Vitale, swam towards shore as well. Mrs. Vitale felt herself giving in, but Mr. Vitale said that he felt the same way and reminded her of their 17 month old daughter, Donna Joy. ‘If we die, who will be there to take care of her?’ he asked, and his wife found new determination to survive. A young man came up to them in the water, and the three held on to one another and drifted towards shore. Charles Filtzer was a proficient swimmer, and Selma was little more than adequate. They swam through the storm for a long time, and then a wave broke over them and carried Charles away. Selma drifted close to a group of passengers supporting one another in the water. She joined them. A number of the other passengers and crew in the group died and Selma, completely exhausted, saved herself by clinging to the body of a dead passenger who wore a life jacket. A corpse also saved the life of Thorpe Aschoff, 27, of Flushing, Queens. He and his wife, Doris, were on the return leg of their honeymoon. They were awakened by the sound of the terrified crowd in the hall outside of their cabin, C-281. They dressed and made their way to the stern, where they remained on the periphery of the crowd for as long as they could. When Thorpe’s ears began to blister, and Doris’ hair caught fire, they jumped together, and made their way to a group of perhaps six other people. They remained with them until some of the women began to panic and grab at Doris, who was wearing a life jacket. The Aschoffs then separated themselves from the group, and treaded water with a girl who they happened across. Thorpe grew exhausted after several hours, and finally removed a lifejacket from the body of a female passenger that was drifting near them. He would later describe the water around them as being thick with bodies that dispersed as the morning progressed. At One point he commented to Doris ‘This is a fine way to end a honeymoon’ to which she replied ‘Don’t say that.’ The three were eventually picked up by a City of Savannah lifeboat that found them more than a mile away from the Morro Castle. George Watremez remembers that once he jumped from the ship it seemed as if he would never hit the water, and once he hit the water it seemed that he would never come back to the surface. When he looked back, he saw that the central portion of the Morro Castle was engulfed in flames. He could see strips of burning paint peeling from the side of the ship and blowing way, as the liner drifted off and the current carried him astern. Although he did not know how to swim, he knew to keep his arms folded across his chest as he jumped, and so he was one of the relatively few to leap from B deck and survive uninjured. However, he soon encountered another hazard of the Morro Castle life jackets: if they were not properly adjusted, they rode too low in the water, and if one stopped treading water or paddling, the effect of the belt was to jack-knife one forward. The clearest memory of one of the rescue pilots, interviewed by Hal Burton in the early 1970s, was of flying over victims who were floating with their heads and legs beneath the surface of the water and their backsides thrust upwards by their ill-fitted life preservers. Throughout the morning George had to continue moving, in order to keep upright in his belt. He was joined by his cabin mate from C-277, a boy who had boarded the ship in Havana. George does not recall his name, but a good case could be made that the cabin mate was teenager Frank Dittman, who was returning to Queens, New York, after spending the summer in Mexico. The cabin mate was not wearing life jacket, and so hung on to George when it seemed that he was becoming exhausted. 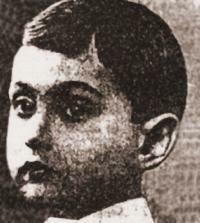 A younger boy, possibly Raymond Lione, joined them. He was not wearing a life jacket, either, and after a brief debate, George’s cabin mate swam over to the corpse of a woman and removed her life preserver. The two older boys, each now wearing a floatation device, kept the younger boy afloat between them as they were tossed about by the waves. In the water, exhaustion soon overtook Edward Brady. He told Adele ‘I don’t think I am going to make it’ and she replied ‘you have to.’ They continued swimming. Adele attempted to encourage him, saying that he had to survive for her and Nancy Ann, and telling him that they would soon be rescued. At one point he told her that he did not mind dying as much as he minded leaving his family, and she told him to keep fighting. Then, he expelled froth from his mouth and died. When a fishing boat found Adele Brady, she was still holding Edward’s body. The crew labored for some time to revive him, but he never came to. The Busquet family rode the waves for several hours. At some point after sunrise, Dr. Busquet gasped ‘I can’t go on’ and died. It was only a short time later that a lifeboat from the City of Savannah reached his widow and daughter and rescued them. Dorothy Coll found her husband in the water, drifting with gym instructor Marco Apicella. Marco was a popular young man who took to the sea after his mother objected to his initial career choice of boxing. 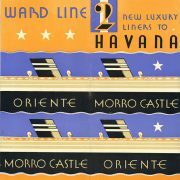 He was, in fact, the only Morro Castle crew member with enough of a “following” to warrant the inclusion of his name in Ward Line’s 1934 advertising- even Captain Wilmott could not claim the same. Although he came across particularly badly in Estelle Chesler’s account, it must be said in his defense that in the crush at the stern, with things happening as quickly as they did, he may simply have been dragged away from the women rather than deserting them as Miss Chesler saw it, and he did remain with, and help, the Colls throughout that morning. When a lifeboat drew near, Dr. Coll, although exhausted, was still coherent enough to point it out to Dorothy. However, as the boat maneuvered into position to pick them up, its stern slammed down onto James’ head and the propeller killed him. Miss Sydney Falkmann, who was one of the last guests to depart from Max Berliner’s party, clung to a piece of charred wood with four other people from the ship. Miss Falkmann had been awakened by the smell of smoke in cabin C-271. Her principal memory of the fire was of the terrified crowd aft on B Deck, and a woman who kept saying ‘I have three children waiting at home. What will they do?’ Sydney Falkmann jumped from B Deck when the smoke seemed about to suffocate her. She and Miss Gertrude Conn clung to the burned piece of wood, along with a steward, another man, and an old lady. The old lady gave up hope as she felt herself weakening, until finally she said ‘I can’t make it’ and slipped off into the water. The four who remained drifted together for hours until a fishing boat found them late in the morning. Lillian Davison realized that she wanted, very badly, to live. Once she determined not to give in to despair, she set her sight on the lights of Point Pleasant and began to paddle towards them. Rain still beat down, in squalls, and her life jacket slowed her progress, but having decided that she would not die, she pushed on. Her legs began to grow numb from the cold water, and she thought to herself ‘Keep trying.’ She came quite close to making it, but while she was still several hundred yards from shore her strength gave out and she felt as if she was going to ‘collapse.’ The surf threw her violently, and she felt herself growing groggy. But, just as with the 1926 car accident, good luck intervened. Crew members from one of the numerous fishing boats that combed the surf area looking for survivors spotted Lillian as she drifted in a stupor. A life preserver was thrown to her, and she was soon hauled aboard. She had been in the water seven hours and swam most of the six miles to shore unassisted. She was placed in the bottom of the boat with three other survivors; a woman, a man, and a child, all carefully wrapped in blankets. She soon fell unconscious and did not recall anything else until she awoke in Point Pleasant Hospital. Mrs. Elsie Hassall floated alone. She was in a stupor when she was recovered around noon, one of the last Morro Castle survivors found. Ethel Hassall, fireman John Kempf, and Miss Karin Klintberg held one another afloat for several hours. Ethel made small jokes and kept the other two passengers talking, and focused, until they were rescued by one of the small craft and brought ashore at Spring Lake. She had no idea where her father and older sister were, but, by coincidence saw her mother brought to shore alive by another fishing boat and carried away on a stretcher, reassuring her that at least part of her family had come through. James Hassall was found adrift in his life jacket by the Monarch of Bermuda, and brought back to NYC in advance of the rest of his family. Several lifeboats passed Reuben Holden and his brother John as they kept one another afloat. Just as Grace Holden feared, the family had been separated upon impact with the water. The boys found one another, but their parents were nowhere to be seen. Finally, a lifeboat appeared and rowed straight at them, not intentionally. 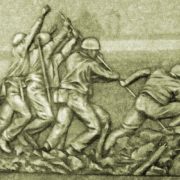 The men aboard were given the choice of running the boys down or picking them up. They were hauled aboard, and if in fact it was a Morro Castle boat in which the boys escaped, they were the only passengers known to have been pulled from the water by a lifeboat from their own ship. Marjorie Budlong swam away from the Morro Castle. She was alone for perhaps an hour before being joined in the water by Franz de Beche. He was nearing exhaustion, and asked if he could hold on to her lifebelt for a time. She agreed, and after he grasped her, they sank low in the water but remained afloat. In the predawn they saw several lifeboats pass them by. Franz was a champion swimmer, but most likely had made the mistake of quickly expending his strength with a protracted period of powerful swimming in the high seas and wind, when treading water would have done as well. He was soon in a stupor, and told Marjorie several times that he could not hold on. Like Adele Brady, Marjorie encouraged him to keep trying. A Morro Castle lifeboat drew near them (Marjorie would tell the FBI that it was within arm’s length of the pair) and Marjorie asked to be pulled aboard. As the lifeboat continued past, she pleaded with them to at least take Franz, who was clearly dying, but the boat moved on, with a crew member calling out ‘We’ll be back for you.’ At daybreak, Franz said a Hail Mary, and shortly thereafter asked Marjorie to let his mother know what had happened. Then he lapsed into unconsciousness, released his hold on her lifejacket and sank. Miss Budlong kept swimming, to keep warm, and at 8:30 was found by a lifeboat from the City of Savannah. George Watremez was alone in the water when the rescue ships arrived. The current and winds had pushed him, his cabin mate, and the young boy, closer to shore and the cabin mate decided to try to swim the rest of the way to the beach. George, a non-swimmer did not make the attempt. If the cabin mate was, in fact, Frank Dittmann, he survived, while the boy, Raymond Lione, died of shock and exposure soon after being pulled aboard a rescue craft. George was numb but still alert when the fishing yacht Paramount drew near and began pulling other survivors from the water. George called out ‘Hey, what about me? I can’t swim’ to crew members of the Paramount, and received the jocular response ‘Then what are you doing out here?’ He managed to climb aboard the ship, and almost immediately lost consciousness. Close to that time, lifeboat #10, with Ann Conway, Floride LaRoche, and Florence Roberts aboard, reached the beach at Spring Lake. The landing was a sloppy one, but the boat did not capsize and the three friends came ashore together~ among the fewer than twenty Morro Castle passengers to escape by one of the liner’s lifeboats. Their friend, Louise Taubert, who had separated from the group when she was afraid to run into the fire along A Deck, was recovered later that morning. She was unburned, still wore her pajamas and Morro Castle lifejacket, and had died of exposure. Lifeboat #1 came ashore safely as well. Many of those on board were already puzzled and disgusted by the actions of Chief Engineer Abbott. The motor, which could have driven the lifeboat into the wind, had never been used; early on, Abbott feared that sparks from the ship might cause it to explode, and refused to allow the crew to start it. For whatever reason, starting the engine was never suggested again. Dr. Charles Cochrane, a passenger in boat #1, heard Abbott remark ‘I’ll be jailed for this’ while they were still in sight of the Morro Castle. The occupants of boat #1 saw another lifeboat come ashore at Spring Lake, and a runner was dispatched to investigate it. He reported back that the occupants were all crew members, to which Abbott replied ‘Well, at least we got three.’ Paul Arneth, Dr. Cochrane and Senora Renee Capote, had all boarded from the boat deck: not a single passenger or crew member was pulled from the water. Doris, Herbert, and Lillian Wacker supported one another in the water for hours, but after some time adrift, Mr. Wacker, who had not enjoyed his cruise, died while his wife and daughter held on to him. They still held him when the Paramount came to their rescue. Decades later, survivor George Watremez would describe the scene on the Paramount as being horrible, with few of those rescued from the Morro Castle being strong enough to stand up, and survivors and corpses lying all over the deck. It is probable that the Wackers did not notice that their friend, Frieda McArthur, was on the same rescue vessel. Governor Moore’s plane located Ellen Kennedy. Mrs. Kennedy drifted helpless- her back had been broken upon impact with the water, and a passenger had jumped down on top of her, knocking out her teeth and injuring her neck. But, somehow, she remained alive and soon Governor Moore’s plane led a rescue boat to her. Her shipboard friends, the Drummonds, were rescued late that morning as well. They jumped from the liner together and helped keep one another afloat in the water. For part of the time they drifted with a Cuban woman- most likely Julia Rueda- who cried for her children, but she was eventually carried away by the waves and current. James Flynn and Ann Conroy, while still holding on to their life ring, became part of the group of perhaps twenty five survivors who supported one another through the long morning. They witnessed the death of Marta Saenz y Aguilera. Eventually, Miss Conroy and Mr. Flynn were pulled aboard the City of Savannah. Selma Filtzer was pulled from the water in shock. She did not say by the crew of which vessel she was saved, but it was one of the three ships that returned to New York City later that morning. Selma was taken home by her parents, Mr. and Mrs. Widder, and put to bed. While she slept, Charles’ body was recovered in New Jersey and returned to Queens. Selma learned that she was a widow the following morning when her father woke her up to break the news. Charles was to be buried by sunset, the day after his death. Selma attended his services, performed by Rabbi Neulander who had married the couple just a week before, and was photographed emerging from the funeral parlor. She was crying, and supported on either arm by Charles’ parents who were also in tears. Years before, the Filtzer’s only other child, a daughter, had died giving birth and Charles had been the family’s hope. Now he was gone, to be buried in Mt. Hebron Cemetery. Within three years, both of his parents would die as well. Selma returned to her parents’ home, and from there vanished from the historical record. By daybreak, the scene aboard the Morro Castle had calmed down considerably. During the first two or so hours of the disaster, there had been several waves of panic as the ship shifted before the wind and those deepest back in the tightly packed crowds on B , C and D Decks found themselves enveloped in smoke and exposed to the worst of the heat. When the aft lounge ignited, those at the back of the crowd stood only feet away from the blaze. These people would push their way forward and go over the rails as a last bid for survival. But, by daylight, with at least two hundred fifty passengers and crew overboard, the situation improved, marginally, for those still on the ship. Nearly everyone had access to a spot along the rail, and it was easier to move to the windward side of the liner as she swung back and forth. And, by daylight, the three large rescue vessels: City of Savannah, Monarch of Bermuda and Andrea Luckenbach stood nearby, giving those trapped aboard the ship reason to be optimistic. ‘Where the hell do you think I can get one for you if I can’t get one for myself?’ said a crew member to Sara Murphy, her mother, Frances, 65, and sister Frances, 47, when they asked for a life preserver for Miss Frances, who did not have one. Sara Murphy had awakened and, as so many others did, saw the reflected fire through her porthole. She roused her mother and sister, and the three women searched their cabin but could only find two life preservers. Miss Frances gave her mother and younger sister the belts, and they ran to the stairs only to be turned back by the flames. The fire was terrific, and none of the three women could breathe. Several Morro Castle passengers and crew members broke bones when C Deck became uninhabitable and they fell as a mass while fleeing down the stairs to D Deck. The Murphy family was among those who fell, and landed together in a heap. Sara and Miss Francis believed that their mother had broken her arm. When they asked a crew member for help finding a life vest, they were crudely rebuffed. After dawn, at close to 5:40, the Murphy sisters led their mother, with her broken arm, to one of the Morro Castle‘s lines and helped her overboard. They slid down immediately after her, but could not find her in the water. Miss Francis and Sara Murphy survived, but Mrs. Murphy was lost. 59 year old James Petrie, of Queens, was also injured in the fall down the stairs between C and D Decks. He broke his leg and his hip, damaged the bone in his neck, and lacerated his face in the fall. Crew members made him as comfortable as possible, and several survivors later commented on the severely injured man they saw “laid out” on D Deck. 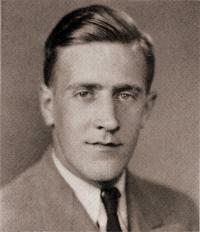 Mr. Petrie was among the last to escape from the burning liner, being lowered overboard to a waiting boat by crewmen. He survived, but his cabin mate, and next door neighbor from Queens, William Haessler, came down with lobar pneumonia after returning to New York and soon died, becoming the final known victim of the disaster. David Schneider recalled that there were crew members on D Deck smoking cigarettes and wearing life jackets. When he asked Purser Tolman for his life preserver, the purser replied that he could not swim himself and would not surrender it. None of the crew members he approached would give him a life jacket, and he later recalled that when an officer asked that crew members turn over their jackets for the sake of women in the crowd, none would. Mr. Schneider remained with the ship for as long as possible and then climbed down a rope to a Monarch of Bermuda lifeboat. Dr. Weinberger remained a calming presence on D Deck through out the morning. The Doctor recalled taking care of crew member Jimmy Bertocci, who had hurt his arm. He also put a splint on the leg of a man who broke his ankle. He spoke of a man who was thrown down from C deck to D Deck and killed, who was most probably the seriously injured James Petrie. He also mentioned seeing Braulio Saenz, dead, on the D Deck promenade. Dr. Weinberger was critical of the lack of leadership shown by the crew. He saw no officers, and did not approve of Steward Pond’s ordering the passengers to jump from the ship~ he felt that there was no reason for the order and that it cost lives. Dr. Weinberger finally went over the side, to help a German woman who was being lowered from the ship by rope. She died as she entered the water, and so he let her go. Dr. Weinberger drifted for about 20 minutes and was picked up by a Monarch of Bermuda lifeboat. 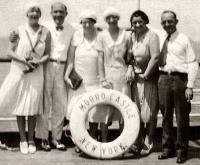 Nathan Feinberg, Francis Nass and Florence Sherman also remained with the Morro Castle for as long as possible. They had seen the disastrous results of passengers being ordered to jump from B Deck, and again saw people injured or killed when told to jump from C. Mr. Feinberg though that the smoke that blew back at them from out of C Deck smelled of burning oil. The heat was terrific, but the three remained calm and resisted the temptation to jump from the ship each time they were enveloped in the drifting smoke. In broad daylight, after 7AM, they could see the Monarch of Bermuda and City of Savannah close by, and lifeboats from both ships in the water. Assistant Purser Lester Ariessohn advised Mr. Feinberg that it was time to go overboard. Most of those who remained on the stern did so around this time, holding on to ropes hanging from the Morro Castle‘s side until the lifeboats came. Nathan Feinberg hung on for about an hour before a City of Savannah lifeboat found him. Francis Nass survived as well, as did Florence Sherman. Mr. Feinberg’s date from Max Berliner’s party, Margie Mayer, was saved, as were her parents. Alice Desvernine met the Whitlocks aboard the City of Savannah that afternoon. The couple were happy to inform her that not only had her cousin, Madeline Desvernine, and aunt Florence Brown survived, but that all three members of the family were rescued by separate lifeboats from the same ship. They were soon reunited. Had Florence Brown succeeded in her attempt to rescue the woman whose life belt was driving her head under water? Neither she, nor Madeline, nor Alice ever said. George Whitlock arranged for the women to send telegrams to their respective families. Upon arrival in New York, Madeline Desvernine was admitted to Broad Street Hospital suffering from shock and immersion. Florence Brown and Alice Desvernine were sent home for bed rest. The Whitlocks returned to their home in Great Neck, Long Island, New York. George was treated for burned eyes in Long Island College Hospital, and the couple granted a few brief interviews to the local press, in which good taste prevailed and no mention was made whatsoever of their exemplary behavior that night. 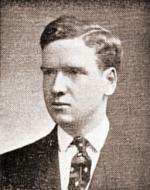 George Whitlock died in 1964. 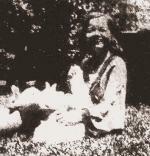 Alice Desvernine never married and died in 1984, while her cousin Madeline lived until late 2003. Abraham and Harriet Cohen continued to swim towards shore. The buildings grew larger, and they could see what seemed to be hundreds of people running along the beach. Abraham swallowed seawater and became ill. Finally, when they were one hundred yards from land they began waving, and to their relief people on the shore spotted them and began waving back. They reached a set of wood pilings and held on to it, and swimmers from the beach came to them and pulled them the rest of the way in. The six mile swim had taken nearly seven hours. They walked ashore, and then collapsed on the beach and were taken to Point Pleasant Hospital. The following day a photograph of the Cohens, showing the couple smiling broadly and toasting one another from adjoining hospital beds ran in hundreds of newspapers across the country. The papers did not note it, but the photograph was taken on Harriet’s 22nd birthday. Further down the beach, Lloyd and Grace Barnstead, of the Bronx, also reached shore after several hours of swimming. They recalled the crowd on C Deck singing ‘Hail! Hail! The Gang’s All Here’ The Barnsteads wore life preservers, and were aided in their long swim by a Morro Castle life ring. 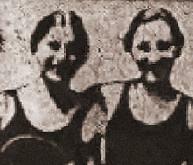 Jules and Martha Blondiau swam most of the way to shore with one another. They had jumped from the stern together, and set out for land almost immediately, with Jules pulling Martha along and supporting her as best he could. After daybreak, with exhaustion setting in, as he later told it to George Watremez, he saw what appeared to be a large snake in the water following “Margie.” It proved to be her fox stole, which she had jumped from the ship still wearing. The stole was disposed of, and the couple kept on swimming. They were in the surf area, 100 yards from the beach at Sea Girt, when a Coast Guard boat found them. Mrs. Mary Robinson from Richmond Hill, New York, and her 18 year old daughter, Lucille went overboard together after fleeing Eleanor Brennan’s party, and made the long swim towards shore. Both lapsed into stupors, and were separated from one another while still some distance out. Mrs. Robinson was found washed up on the beach, semi-conscious and calling for Lucille. Lucille came ashore alive as well, and mother and daughter were soon reunited. Betty Sheridan was unable to find her son, Arthur, whom she had pushed overboard, or her brother Thomas Featherstone, whom she assumed jumped with her. A Morro Castle waiter helped her through the long hours until rescue came. Both were taken aboard the Andrea Luckenbach after daybreak. She was taken to Coney Island Hospital, suffering from burns, shock and exposure. Clemens Landmann, and his wife and daughter, survived. They must have been rescued by one of the fishing vessels, for both Mr. and Mrs. Landmann were admitted to Point Pleasant Hospital suffering from shock and exposure. Their FBI deposition is detailed only as far as their experiences aboard the ship are concerned. Linguistic difficulties were encountered, and so their first-person account ends with them jumping from the ship. They traveled on to New York, and the Alamac Hotel and there vanish from the record. Marta, 12 in 1934, could conceivably still be alive in Germany or Cuba. Angelus D’Orn, who escaped from her cabin with only seconds to spare, was found adrift, and brought to New York City unconscious and seriously burned. She was taken to Bellevue Hospital, still unconscious. The rest of her story is not yet known, other than that she recovered from her injuries. The Vitales were brought back to New York City and put to bed at the Hotel New Yorker, exhausted, by the Ward Line. The New York Daily News ran a photo of them taken in their hotel room. They gave only brief interviews before returning to their home in Detroit, Michigan, and their daughter Donna Joy who had given both of them the will to carry on. Josephine Jakoby was taken to Fitken Memorial Hospital in Asbury Park, suffering from shock and immersion and an injured spine. She was released in time to attend the funerals of her son and husband. The services were held at St. Michael’s Roman Catholic Church in Brooklyn. Josephine was able to view the bodies of Henry Jakoby and Henry Jr., at the undertakers. Her son was uninjured and was dressed for viewing. Henry Sr. had received severe head injuries and was badly cut. 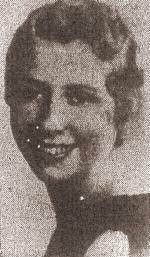 Josephine’s friend, Marie Renz, who was inadvertently drowned by her rescuers, was recovered. Martin Renz was pulled from the water by the Monarch of Bermuda and returned to New York in shock, where he gave a few brief interviews about Marie’s death. Minnie Likewise survived as well, but her husband Jacob died. Josephine Jakoby never remarried. She died in 1974, at the age of 92, and was buried with her husband and son at St. John’s Cemetery in Queens. Adele Brady was more fortunate than Josephine Jakoby. Although she had seen her husband die, she was reunited with her daughter Nancy Ann, who had been swept away by the storm as soon as she entered the water. She had drifted in her lifejacket until rescued, and suffered only mild shock and the effects of immersion. Lillian Davison and Martha Bradbury both survived. They dutifully phoned Columbia Presbyterian Hospital to explain that they could not be at work on the 1 PM shift, and were excused from service. Each was hospitalized for a day in New Jersey, and then Columbia Presbyterian sent an ambulance for them, so that they could fully recover in familiar surroundings. Lillian recounted, for the press, her prior experience with a shipwreck. In 1912, her father’s servant at the family home in Athenia, New Jersey, procured a job in the Davison household for her sister. 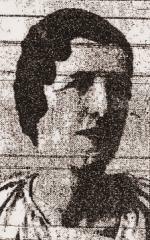 The sister, Bertha Ilett, embarked on the Titanic, and was among the survivors. Lillian heard the story many times growing up, and the press in Northern New Jersey could not resist using this Titanic tale as a human interest sideline to Miss Davison’s interviews. Mrs. William Landes, distraught, showed reporters the letter her daughter, Doris, had sent to her from Havana, in which she excitedly described the most wonderful week of her life. There was no word about Doris, or Mrs. Byrne, or Mrs. and Miss Stemmermann. But, by day’s end, there would be mostly happy endings on 122nd Street in Richmond Hill. Doris was alive, in Fitkin Memorial Hospital in Asbury Park. Her face was burnt red, as if by a severe sunburn, and her lungs were damaged by the smoke she had inhaled, but her injuries were not life threatening. Doris had drifted for nine hours in her life jacket, and was in a deep stupor when a fishing boat found her. Mrs. Stemmermann, and her daughter, Ann, were picked up by fishing vessels as well. But, Marie Byrne, 50, was dead and would be identified by her son before the weekend was over. The Hassall family reunited in their home on Stafford Avenue in Forest Hills. They returned home separately, over a period of two days. They considered themselves fortunate to have fared as well as they did. No family members were lost, or severely injured, and all four Hassalls had acquitted themselves well during the emergency. Loretta’s friends from the voyage were not as fortunate as she; Henry Borman survived, but Ann Litwak and Fannie Fryman, who had gone to bed just a few minutes before the disaster commenced, were lost. Fannie and Ann were 22 years old. Fannie worked in her parents’ grocery store in Philadelphia, Pa., while Ann was a bookkeeper for a radio dealership. 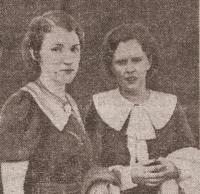 Miss Litwak and Miss Fryman attended South Philadelphia High School for Girls, were described as ‘inseparable friends’ and graduated in the class of 1930. The cruise may well have been their first big adventure as adults. Ann died in the water, and Fannie was brought ashore to Point Pleasant Hospital, where she also died. Ann Litwak was widely reported as a survivor, and her family was summoned to Point Pleasant Hospital by the Ward Line, only to discover that a horrible mistake had been made when they arrived. By midweek, her body had not been found, and her mother had collapsed from the strain. Her brothers saw a newsreel in which a woman who resembled Ann was shown being brought ashore alive in New York, and had the frame extracted from the film and blown up. At the point where the story was dropped from the newspapers, the Litwak family was imploring the woman in the film to come forward, so that they could be completely assured that it was not Ann. Miss Litwak’s final moments can be traced by reading the accounts of Joseph Bregstein and Gladys Knight. Dr. Bregstein, blinded by the smoke that enveloped him and Mervyn recalled that the Knight sisters and Ann Litwak stood near him just before Mervyn and Ethel Knight went overboard. Gladys Knight did not mention Ann Litwak by name, but told of a woman she met while standing by the Bregsteins, who was not wearing lifejacket and who asked if she could hold on to Gladys in the water. When they went to the rail, the woman looked down at the waves and then turned to Gladys with a terrified expression and said ‘I just can’t.’ A few seconds later, the Knights and Mervyn Bregstein climbed the rail and jumped. No one who survived recalled seeing Ann Litwak any later in the disaster’s progress than this. Henry Borman was one of the few aboard the vessel to see his life changed for the better by the disaster. The 17 year old boy had found Ann Stemmermann struggling in the water. They kept one another afloat for six hours and, Ann would later tell friends and family, she knew then that ‘he was the one.’ They went their separate ways. Henry graduated from Rensselaer Polytechnic in 1939, served in the military, married and had children. Ann studied nursing, married, raised a family, and worked as a school nurse in Pennsylvania. In the early 1970s both were single again. They re-established contact and, in 1975, married. Henry Borman died in 2000, and Ann Stemmermann Borman died in the summer of 2006. Dr. Bregstein returned to his Fourth Avenue apartment in Brooklyn to await word of Mervyn. The Doctor had gone down to D Deck and remained with the ship until after 7AM. He lowered himself from the side and was picked up by a Monarch of Bermuda lifeboat. Both Knight Sisters were shown as survivors, but from the start Mervyn was listed as missing. Gladys Knight was photographed with Benito Rueda, the boy she saved, by the New York Daily News. Benito told reporters that he would marry Miss Knight when he grew up, in gratitude for her rescuing him. For Ethel Knight, there would not be a similar joyous reunion before the press. She had been carried by the waves with Mervyn Bregstein for hours. She recalled being semi-conscious, and drifting near a group of survivors in the water. She vaguely remembered someone taking Mervyn from her before she blacked out. Mervyn was never seen again, and his body was never found. Ethel married her fiancé, William Celatka, shortly after the disaster but their marriage was short lived. She died of a heart attack that her family blamed on her Morro Castle experiences, on December 3, 1934. Joseph Bregstein married Muriel Rubine. He headed the Morro Castle survivor’s organization for a time. Both he and Gladys Knight died in 1972. 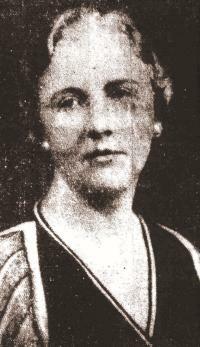 Ann Conway and her friends from Lifeboat #10, were taken to the hospital for observation but apparently only Floride LaRoche was admitted- her head had been badly cut by glass falling down on to the lifeboat from shattering promenade deck windows. The large group of young friends with whom she had socialized fared well. Thomas Pearce, J.M. Chalfont, Gouverneur Morris Phelps Jr. had all survived. Miss LaRoche and Miss Roberts had also escaped. But, 26 year old Morton Lyon had died after breaking his neck jumping from the ship, and Francis Stewart had died of exposure and exhaustion. Mr. Stewart was on his first cruise, and considered himself lucky to be there. He had saved his money for a Morro Castle vacation and then found nothing available in his price range when it came time to book passage. He had resigned himself to a week off spent “puttering” but was called on sailing day, September 1st, by his travel agent and informed that a cabin had become available and so, at the last minute, his dream vacation became a reality. The last time he was seen alive was by his cabin mate in stateroom 353, George English. Stewart was struggling to pull on his lifebelt as the hall outside of their cabin ignited. And Louise Taubert, who had hesitated to run towards the fire, had also died. Anne Behling and another young lady drifted together for over five hours before a fishing boat found them and brought them to shore. Her watch had stopped at five minutes of five, revealing the approximate time that she had jumped from the stern. Miss Behling recovered in New Jersey and returned to Philadelphia in the week after the fire. She gave several newspaper interviews, and was deposed by the F.B.I. at some point 1934 or early 1935, but, somehow fell through the cracks and appeared (and still appears) on many lists as a bona fide victim of the disaster. A lifeboat from the Monarch of Bermuda rescued the Davidsons, and the others from their group, late in the morning. They were taken aboard the ship, and sent below. Sidney had broken all the fingers on one of his hands as he and Dolly were pulled aboard, but other than that injury they had faired well. Captain Francis of The Monarch somehow learned that a honeymoon couple was among the rescued, and took a few moments to meet with them and see to their comfort. James Flynn and Ann Conroy survived together, but as of yet no evidence has surfaced to say that they kept in touch after their seemingly romantic stroll went horribly awry. James’ cabin mate, Milton Klein, died in the disaster. His final moments were heroic~ Adele Wallace, of Hartford, told several interviewers that she had taken a lungful of smoke and was about to black out when Mr. Klein took the water soaked handkerchief he was holding over his nose and mouth and placed it over her face. This gave Adele the few seconds she needed to make it to the rail and jump for her life, and she feared that the same smoke that nearly killed her might have suffocated Mr. Klein before he had the chance to escape. 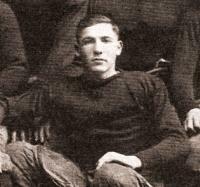 When he was found, and identified by his cousin, Morris Biber, his body (#50) was burned and was not wearing life jacket. Frank Tosti, a young man from New York City who many survivors later remembered, in the terms of the day, as being “a swell guy,” apparently also died of burn injuries in the water. He was last seen alive helping other passengers to climb the rail and jump, and his body, when recovered adrift, was massively burnt. Charles Elias, a successful businessman, and social leader of the Passaic, New Jersey, Jewish community was widely reported as being badly burned on his arms and face when he washed ashore several days after the fire. After his closed-coffin ceremony, his sons took time to deny to the press that their father had burned to death – the damage to his face and arms was from decomposition and not fire. Estelle Chesler and Bessie Weinrub floated with their Morro Castle life ring for over six hours. A fishing boat rescued them after 10:30 AM. 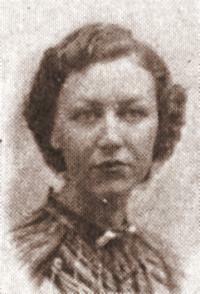 Meyer Perlmann identified the body of his 38 year old wife, Bessie, the following day at Sea Girt, New Jersey. She was buried in the Tillem Kess section of Mt. Zion Cemetery in Queens, NY. Miss Chesler, 36 in 1934, never married, and died in late 1975. Beach in 1948. Abraham worked there as a building contractor, and died of a sudden heart attack on November 2, 1954 at the age of 49. Harriet was active in B’nai Brith and Hadassah, worked as a bank officer, and was a president of the Society of Real Estate Appraisers. Widowed at the age of 42, she did not remarry. She lived until November 2002, and after her death was returned to Hartford where she was buried with Abraham at Beth Israel Cemetery. 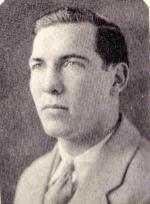 Betty Sheridan’s husband, James, identified the bodies of his son, Arthur, and brother in law, Thomas Featherstone. Thomas was found quickly, but Arthur was missing for some time and was eventually located at Waters Funeral Home in Jersey City, where 48 difficult to identify bodies were taken. The Featherstone family revealed that Thomas’ face had been severely damaged, with his jaw dislocated and his head swollen, and that Arthur’s face was cut. Apparently both were victims of the cork life jackets. Mrs. Sheridan broke down, briefly, at the news of the deaths but then recovered. She had felt, all along, that neither had survived. She and James Sheridan returned to Wilkes- Barre, where her son and brother were laid out in the family home on Hanover Street. Third Grade classmates of Arthur’s from the Coyningham Building School in South Wilkes-Barre recalled that the boy spoke excitedly- and frequently- about his coming trip aboard an ocean liner. Arthur Sheridan and Thomas Featherstone were buried at St. Mary’s Cemetery after a mass at St. Therese’s Church in Wilkes-Barre. Happy letters that Betty and Thomas had mailed home from Havana began to arrive early in the week after the fire, preserving the final good memories of Mrs. Sheridan’s only child and brother. 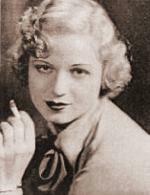 Betty Sheridan died in 1988, in Pennsylvania. A happier note was struck by the safe return of 72 year old twins Michael Dulk and Kate Noteboom, of Brooklyn. Michael Dulk, a retired fireman, was on the scene in the early stages of the fire and helped man a hose. Mrs. Noteboom had awakened him to let him know that she smelled smoke. They went to the lounge together and saw fire coming out of the writing room locker in a manner that Mr. Dulk later described as ‘strange looking.’ He helped get the kinks out of the hose the crew was using, and directed them to aim the stream of water at the base of the fire. When the smoke grew too thick, he took his sister to the stern and they remained there until after daylight. A Monarch of Bermuda lifeboat appeared below them, and Michael instructed his sister to slide down one of the stern lines. She did, and was immediately picked up. Mr. Dulk did the same, and was rescued by a Coast Guard boat crew. Both brother and sister suffered from inflamed eyes, which Michael Dulk blamed on the noxious effects of burning chemicals. Anna Siegmond and Emily Beck drifted for five hours before a lifeboat crew from the Andrea Luckenbach found them. Mrs. Siegmond still held her pocket book, for which she had returned to her cabin during the early stages of the fire. Later, after arriving in Brooklyn where she recuperated in the home of friends, she found that her bag had been gone through and $35 stolen. George Watremez was brought ashore in New Jersey, and was one of only nine passengers in good enough shape to return to New York City by special train that afternoon. Among the others was Sydney Falkmann, Max Berliner’s guest. The survivors arrived at Pennsylvania Station and were taken to the Hotel New Yorker, where the Ward Line provided them with rooms. George, chafed raw by the constant motion of his clothing in the water, was reunited with his mother and family upon arrival in New York. James Coll was identified at the Bellevue Morgue in New York City, his head damaged by the blow from the lifeboat. A newsreel clip of Dorothy, looking beautiful but haunted, interviewed on the pier immediately after being brought back to New York, survives. George Watremez does not know what became of her, but a 1934 newspaper account reports that after James’ funeral services in Jersey City, she took his body to Lakewood for burial and returned to her father’s home in Brown’s Mills. That is where the FBI found, and interviewed, her in 1935. Dr. Braulio Saenz found his daughter, Marta, in a temporary morgue in New Jersey. His wife and two other children were missing. A few bones in Cabin A-23 were all that remained of Caridad. Margarita was missing and would never be found. Braulio, who was known to have died on D Deck, was missing as well. The heat in the spot where he died was not intense enough to entirely cremate a body. The abandoned personal effects of passengers lay strewn about the rear portion of the liner, charred but not destroyed, yet in the extremely detailed records the Ward Line kept of human remains found aboard the ship, no mention was made of a body being found on the D Deck aft promenade. Several newspaper accounts from the Tuesday after the fire mention the charred remains of a boy being taken from the ship. That the Ward Line and the Asbury Park Fire Department reports omit this discovery is puzzling. Dr. Saenz charted a plane to comb the ocean for drifting bodies, but his missing child- and perhaps children- was never located. Dr. James Borrell phoned his brother and sister in law, Joseph and Edna Cleveland, from the home of the Spring Lake doctor to which he had been taken to rest. He told them that he had been in the water for five hours, and sobbed ‘They haven’t found Henrietta yet. Oh, it’s awful!’ before the phone was taken away from him. Dr. Borrell was sufficiently recovered on Sunday the 9th to travel to the morgue at Sea Girt, where he found her. Mrs. Borrell had eight brothers and sisters, but was closest to Edna Cleveland. So, Edna and her husband traveled to Spring Lake to help Dr. Borrell bring Henrietta home. They found that James Borrell had collapsed upon identifying his wife. Until he saw her body he believed that she was safe, somewhere, ashore. The Clevelands arranged for Mrs. Borrell to be returned to Buffalo by train. She was buried at Forest Lawn Cemetery after private services. One final duty remained. One of Henrietta’s brothers traveled the Biltmore Hotel in New York City, to reclaim Dr. Borrell’s car, left there at the start of the spontaneous and romantic cruise. Dr. Borrell survived Henrietta by only five years. He died in September 1939, at age 48, after an illness of two weeks. Dr. Henry Strauch and his wife, Ruth, were brought back to Donora, Pennsylvania. They were laid out for viewing in the parlor of their home on Meldon Avenue, and hundreds of friends and neighbors filed past to pay their final regards. They were buried together in Monongahela Cemetery. Helen Brodie was hospitalized, in deep shock, in New Jersey. Upon awakening she weakly asked ‘Where is Agnes?’ Her family assured her that Agnes Berry, her cousin, was alright but, in fact, she was missing. Her body washed ashore at Manasquan, New Jersey, on Sunday and after Catholic rites in her adoptive hometown of Springfield, Massachusetts, was buried in her birthplace, Richmond, Vermont. Eleanor Brennan, their hostess, was identified on Sunday, September 9th, and taken to the Bronx, where an overflow crowd of friends and coworkers from Macy’s, estimated to be 1000 people strong attended her wake. An equally large crowd attended a second wake, held in the parlor of her aunt’s home in Carmel, NY, where Eleanor had grown up on a farm. She was buried in St. Lawrence Cemetery in Brewster, NY, after services at the Church of St. James the Apostle. Reuben Holden III was reunited with his sons, but Grace Holden died. She was identified in a temporary morgue in Sea Girt, New Jersey by the manager of the Monmouth Hotel. Reuben Holden IV attended Yale, was a member of Skull and Bones, worked in Intelligence with George Bush, Sr, and married Mr. Bush’s cousin. He served as the Secretary of Yale in the 1960s, and died in 1995. His brother, John Morgan Holden, Yale 1944, died the same year. Their father, who remarried, lived until 1967. Israel Rudberg returned to Shenandoah, Pennsylvania. In his pocket he carried a souvenir of the voyage – a roll of film that, when developed, proved to contain photos of four passengers he befriended who died in the fire. Officials of United Fruit escorted Joseph Jova to the temporary morgue at Sea Girt, to look for his nephew Roberto Gonzales. They soon found him. Somehow, Roberto, whose cabin door opened directly on to the boat deck steps away from the group waiting to board boat #10 had been overlooked, and was lost. Isidore Gonzales flew to New York, and after attending a mass at St. Mary’s Church at Newburgh, returned to Cuba with Roberto’s body, which was buried at Cienfuegos on Wednesday, September 19th. The Powellton Club, where Roberto had been a favorite cancelled its annual water carnival and swim championship in memory of Robert. Henri Jova, his cousin who was able to honor the original booking, arrived safely in New York aboard the Quirigua on September 10th. Ramon Ferner, who died so that the occupants of #1 could survive, was never found. His parents showed reporters his bedroom, filled with high school mementos, and his stamp collection. Eerily, when they cleaned out his room, Mr. and Mrs. Ferner found an “If I should die” letter Ramon left, addressed to them. They showed it to the press, who demonstrated rare restraint and did not quote directly from it. Most of the 128 who died aboard the Morro Castle that morning were recovered. 94 bodies were identified, at least 13 were not, and perhaps twenty went permanently missing at sea. In a cemetery behind what was Fitken Memorial Hospital in 1934, most of the Morro Castle unidentified lay under identical stones. It seems that a handful of other unidentified victims were buried elsewhere. 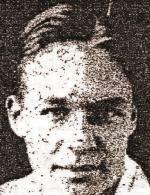 Passenger Frank Meley, 45, of East Orange, New Jersey, who remains on the official “missing” list, was actually recovered in an advance state of decomposition and identified through persona effects and, tentatively, from a post-mortem photograph taken at Waters Funeral Home in Jersey City. 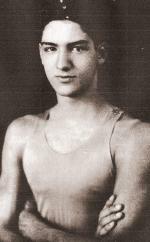 1934 accounts of his belated identification mention his being buried with other unidentified bodies in Linden, New Jersey, but the number of Morro Castle victims interred there, and in what cemetery, has not been determined. A faded color home movie survives, shot for reasons unknown, and showing many of the victims laid out somewhere on shore. Many who died that morning figuratively vanished, with no first person accounts left to document their final, terrifying moments. 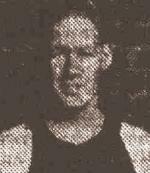 Grinnell graduate John Kent, a well to do young man working for the Pennsylvania Welfare Department traveled in the same circles as many of the other young Philadelphian passengers yet none mentioned seeing him that morning. Milton Listic, a jockey from Worcester, Massachusetts, died alone and without note, although his cabin mate John Kempf did later recall that he, at least, was awake and got clear of their room. Sophie Altenburg, 60, a member of the Concordia Singing Society, must have boarded the ship with a heavy heart, having just experienced a family tragedy. Her sister owned a gas powered washing machine. She got careless, allowed the water to boil over and douse the flame, and was overcome by the fumes and killed in her own laundry room. Mrs. Altenburg’s family last saw her alive at the funeral. She traveled on the Morro Castle with her friend, Minnie Davis, and died unnoticed in the storm. Police officer Adolph Kosbothe and his wife, Mary, and engineer Henry Hagedorn and his wife Minnie, all Concordia Society members, occupied mirror image cabins on opposite sides of D Deck. Both couples died, and no one spoke of them later. Mary Kosbothe and Minnie Hagedorn’s bodies were recovered, but Adolph and Henry were never found. The geography of their cabins allows one to venture a guess as to what happened to both couple. More likely than not, they awoke to find themselves trapped. Mrs. Kosbothe and Mrs. Hagendorn were slender enough to fit through a porthole wearing life jackets. Their husbands were not. Louise Overgene, a veteran teacher who had served the Newark school system for 38 years, vanished so entirely that even her complete name was lost. Virtually every published list referred to her simply as “Miss Overgene” with no name, first initial or home address given. Were it not for an article in a Newark newspaper and a citation in a Ward Line internal document, this most elusive of victims would remain nameless. Louise died of exposure, as did her traveling companion Letty Mohr, and there was no one to tell their stories. Franz Hoed de Beche’s body was never located. He is well remembered in Cuba. In 1953 his family dedicated his memorial, El Estadio Franz de Beche in Guanabacoa, Havana. The stadium is often fondly recalled by Cuban-Americans in their reminisces, and 54 years later retains its pre-revolution name. Estadio Franz de Beche is not only a site for sporting events but also a cooperative extension at which aspiring athletes can be trained by professionals acting as tutors. Franz’ nephew, Gustavin, born to his sister Pauline in 1936, became a revolutionary and was executed in Bolivia in 1966 while fighting for Che Guevara. There is a monument to him in Marti Park in Havana, and a smaller one nearby dedicated to his uncle, Franz Hoed de Beche, who died when a lifeboat only an arms length from him and a heroic 18 year old girl would not stop to pick them up. Marjorie Budlong lived until late 1998. Her friends, Rosario Camacho and Doris Wacker, are still alive as of 2007. Doris Wacker was extensively interviewed for the 2006 book When the Dancing Stopped, in which can be found a photograph of her, with her parents and Marjorie, on the beach in Havana. Rosario Camacho lives in the United States and prefers not to discuss her Morro Castle experiences. Dolly Davidson died in September 2005. During the course of a long life, she had been a child actress opposite W.C. Fields, a Fifth Avenue model, and a mother. Her marriage to Sidney Davidson failed, but a second marriage proved long lasting. Mrs. Dolly McTigue is fondly remembered by those who attended the Morro Castle reunions for her quick wit and her fashion sense: well into her eighties, the former model still dressed the part and was always perfectly turned out in something new and stylish. Ellen Kennedy was hospitalized in New York City. Her parents, the Coopers, and her daughter were told to prepare themselves for her death. Mrs. Kennedy was 7or 8 months pregnant when she was thrown from the ship, and her child, a son, died at birth. James Kennedy drowned, but his body was recovered. His daughter, “Honey” would remember the funeral for the rest of her life; she was picked up so that she could kiss his burned and drowned body, and forever after would associate the scent of lilies with the smell of the flowers that permeated the Kennedy residence, where James’ body was laid out. Ellen, although given up for dead, was a fighter and refused to accept the diagnosis that she was a cripple. Over a period of more than a year she forced herself to learn to walk again, for her own sake and that of her daughter. She learned the ins and outs of Wall Street and became a millionaire off of day trading. She lived until 1987. For the final 53 years of her life she carried two reminders of September 8th 1934 with her every day: a high quality pair of dentures which replaced the teeth she lost when someone landed on her jumping from the Morro Castle’s stern, and the engagement ring James Kennedy gave her, which had been raked out of the ashes of their cabin and returned. Investigators sifting through the debris of the Morro Castle‘s interiors found small fragments of the personal effects of those trapped aboard that morning. 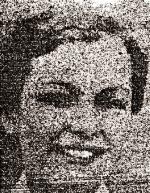 In A-17, Rosario Camacho’s wardrobe of beautiful clothing, and all of her traveling possessions, were reduced to ashes except for a Cuban cent, an American penny and a pair of scissors. 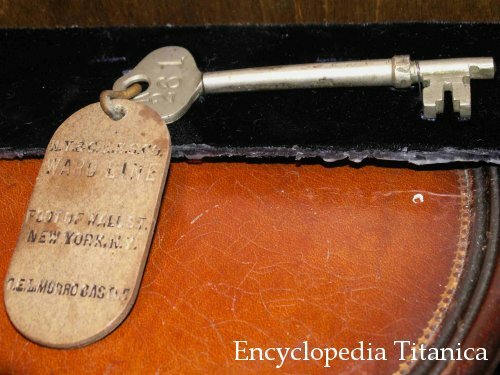 From Doris Wacker and Marjorie Budlong’s cabin searchers sifted out one ring with its stone melted, five nickels, seven pennies, three keys, five keys attached to a key case, two sets of ear rings and an inch long gun shaped “novelty.” Among the items recovered from cabin 219, Ann Conway’s friends’ room were a number of keys, small change, several damaged pieces of jewelry and three streetcar tokens. In 230, Ann Conway’s belongings had vanished except for a set of ear rings. The Hassall sisters were left with a heart shaped brooch, a medallion, part of an ear ring, several pieces of jewelry that had fused together and some small change. To Frieda McArthur the Ward Line was able to return only a broken lavaliere, a class pin, a thimble, twelve coins and a good luck piece. The Cohens received two keys, part of a ring, three sets of ear rings, one ear ring and some small change. Selma Filtzer had only two keys, a tie clasp, two studs and part of a watch chain to remind her of her honeymoon and seven day long marriage. From Reuben and Grace Holden’s cabin came a broken bracelet, with twenty one diamonds in one piece and two in the other. The smaller piece was fused to a brooch with twelve diamonds set into it. Among the other personal effects returned to Grace’s widower were eight small clay figures. The Holden boys received a belt buckle inscribed R.A.H., fourteen coins, three cuff links and a small green glass figure. In 259, Henrietta Borrell’s $3800 worth of jewelry had fused into a mass, the identifiable portions of which consisted of a diamond studded wristwatch, her diamond wedding ring and two loose diamonds. Eleanor Brennan’s gold compact, crucifix, travel clock, and bracelet were found. In the crew lockers, investigators found heroic Ramon Ferner’s camera, negatives, knife and raincoat. Water cascading through the ship for nearly a week after the fire had swept much of the interior clean, and nothing at all was found in the cabins of the Bradys and the Jakobys, or most of the cabins in the vicinity of the second funnel and aft. Thanks to the amazing staff of the Stephen B. Luce Library at SUNY Maritime, Throgs Neck NY, in particularly Ms. Felicia Berke, for giving me access to the Crocco papers and other Morro Castle documents on file. I would be remiss if I did not thank Deb Whitcraft at the Museum of New Jersey Maritime History, Beach Haven, New Jersey, for allowing me the full run of the museum facilities and for the unexpected gift of a genuine Morro Castle life jacket! The number of individuals I wish to thank is large. Mike Poirier and Marty Oppenheim are at the head, Marty for providing lots of support and for making research trips to Newark and the Long Island Room for me! Marty and Danny Land are also thanked for opening their home and private library to me. Harald Advokaat is thanked for digitally reassembling the deck plans from the fragments I sent via email file, and for the Morro Castle artwork he executed for this article. Deirdre Hosen, grand daughter of Ellen and James Kennedy not only generously shared her family story for me, but proved to be a powerhouse of a researcher who provided enough leads to keep me busy thought 2008. George and Jeanne Watremez, and their daughter, Paulette Cole. RAD of the Buffalo, New York, Public Library. Donnis Headley and Beth Vaccarro of the Donora, Pennsylvania, Public Library. Jeffery Bennett at the East Orange, New Jersey, Public Library. Susan Lipstein, of the Hillside, New Jersey, Public Library. The staff of the Long Island Room at the Jamaica Public Library, Jamaica, New York. Michael Angelo and Jean Givey, Thomas Jefferson University. John Beekman, of the Jersey City, New Jersey, Free Public Library. Mahopac, New York, Public Library. Rita Forrester of the Newburgh Free Public Library. Jean Ellis of the Passaic, New Jersey, Public Library. Jane Thoner, of the Plainfield, New Jersey, Public Library. Amy Rupert, of Rensselaer Polytechnic Institute. Maggie Humberston, of CVHM Research Associates, Springfield Massachusetts. Elaine Stefanko of the Osterhout Free Public Library, Wilkes- Barre, Pennsylvania. Wendy Anthony, of the department of Special Collections, Lucy Scribner Library, Skidmore College. Felicia Berke, of SUNY Maritime. Linda Hall, of Williams College. Yonkers, New York, Public Library.